This 1,067-acre waterfront property includes a working cattle ranch, a 13 bedroom estate home that can be converted into a boutique hotel, and titled oceanfront land. 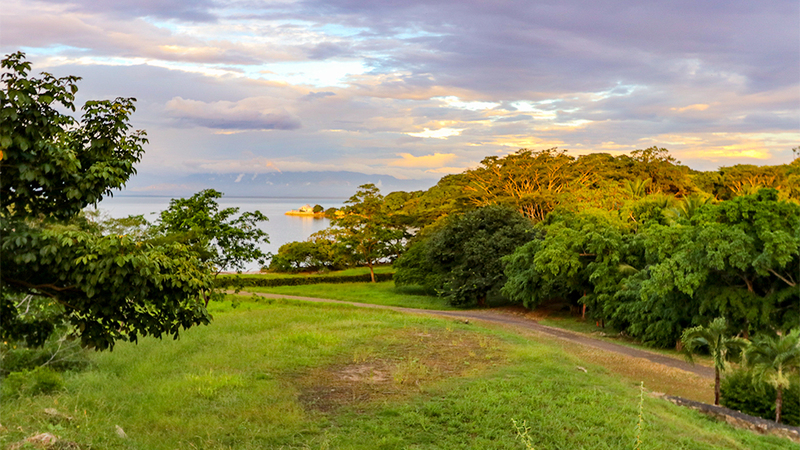 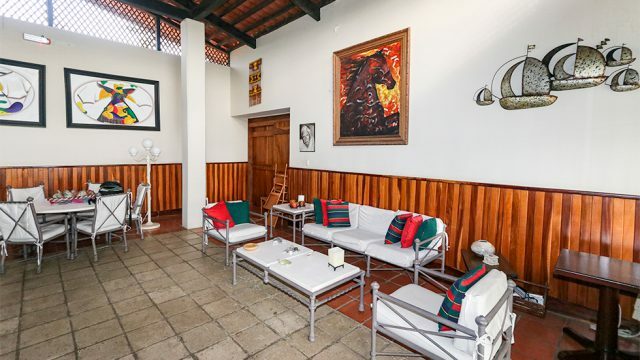 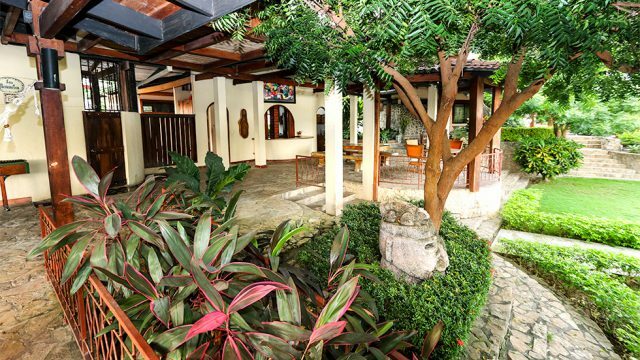 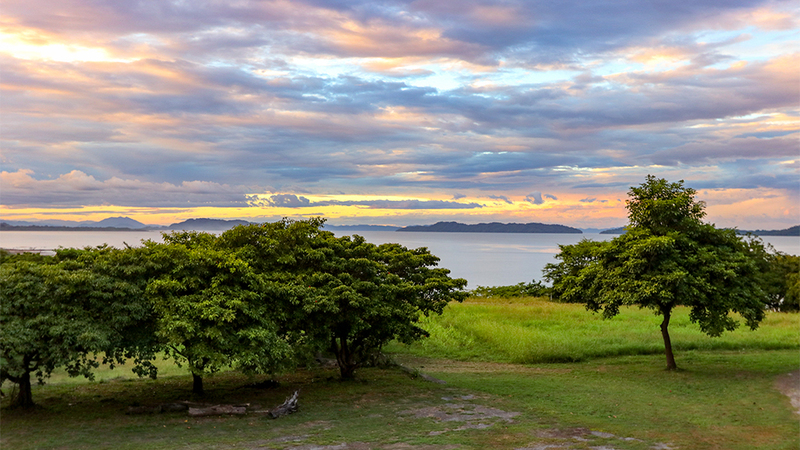 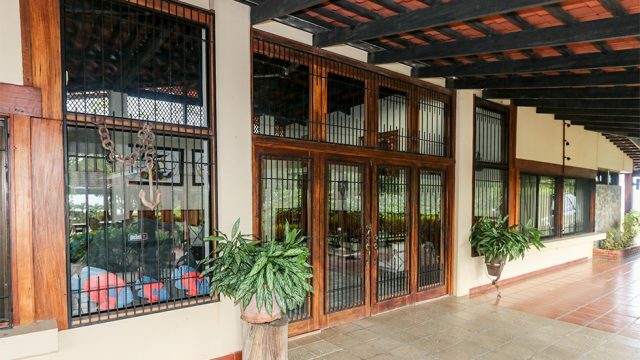 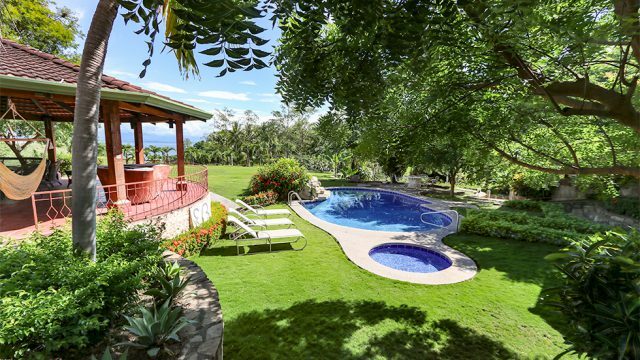 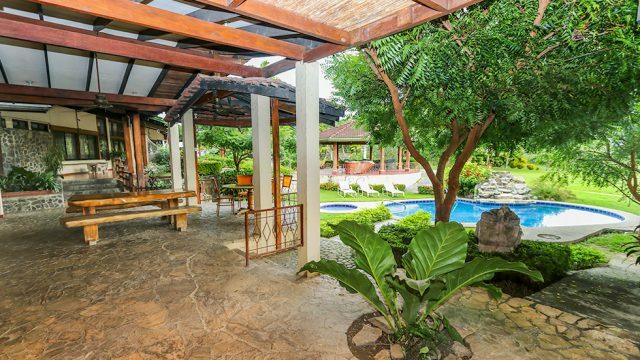 Located on Cabo Blanco, in the sheltered waters of the Gulf of Nicoya, this classic Costa Rican Hacienda hits all the marks when considering the most essential criteria for establishing a successful hospitality business or residential home development in Costa Rica. 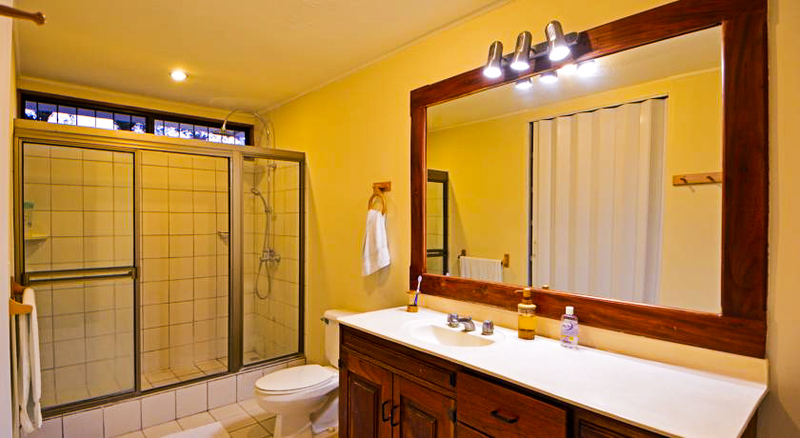 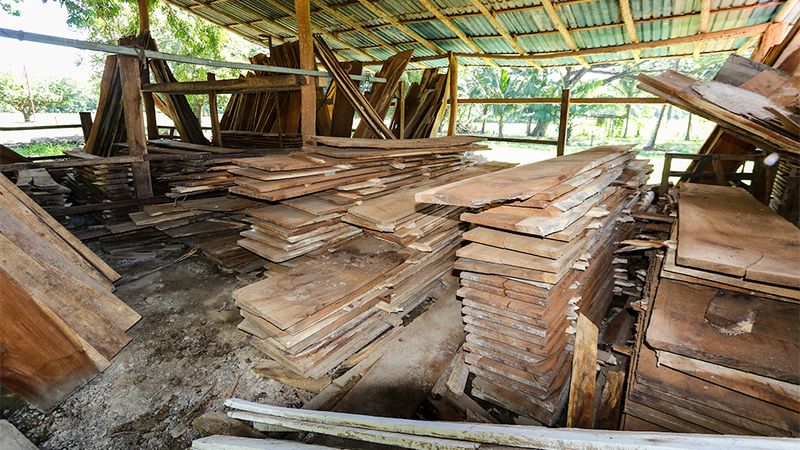 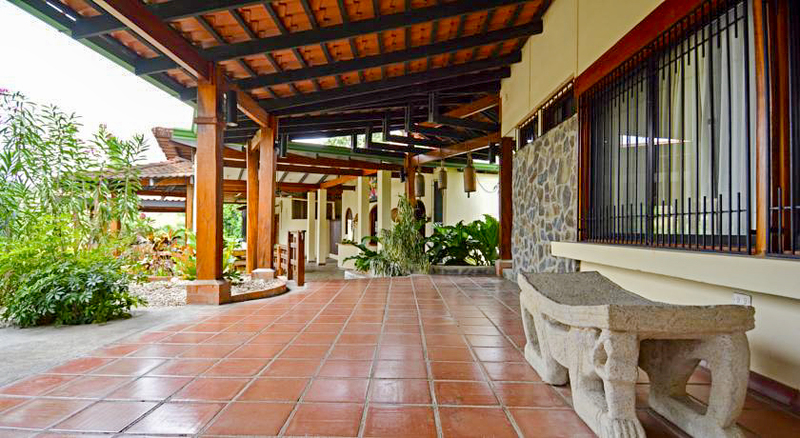 The property features natural characteristics that will attract visitors. 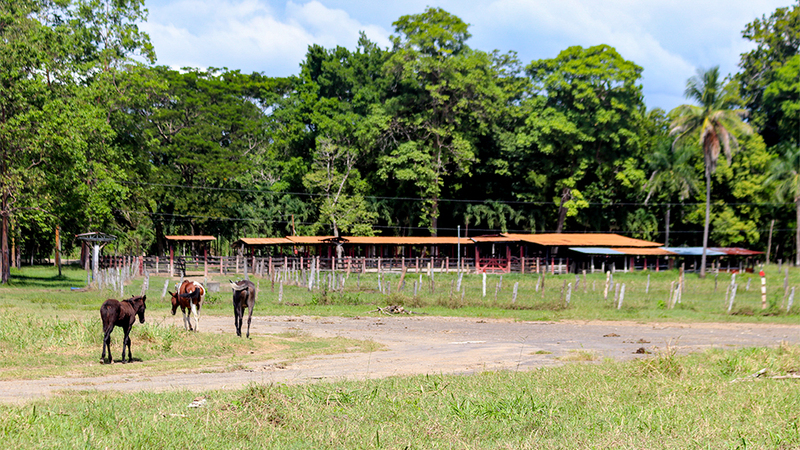 There are multiple transportation methods to get to the property. 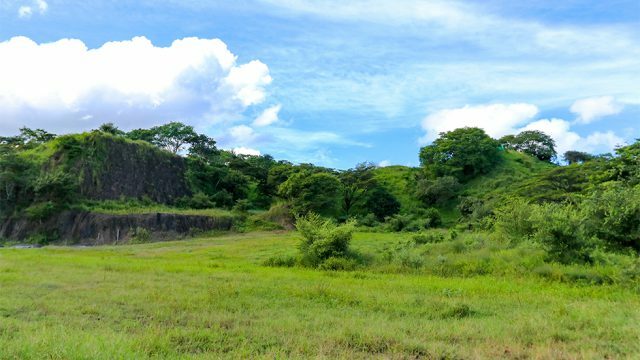 The topography provides an excellent canvas for a wide variety of development opportunities. 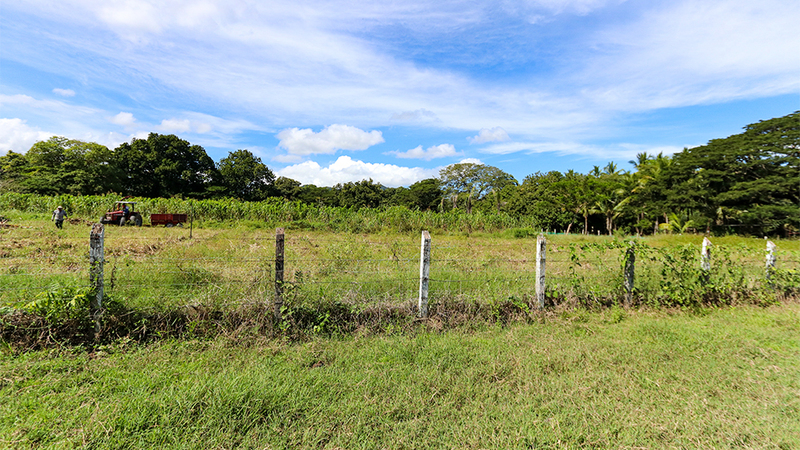 The property includes zoning and infrastructure that will ease and expedite the development process. 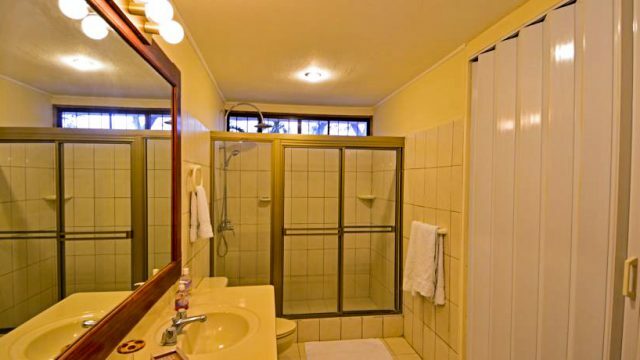 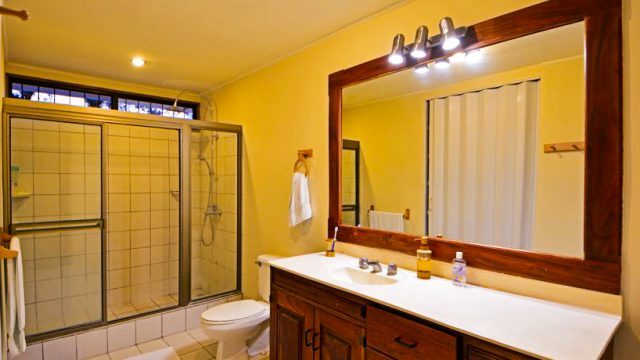 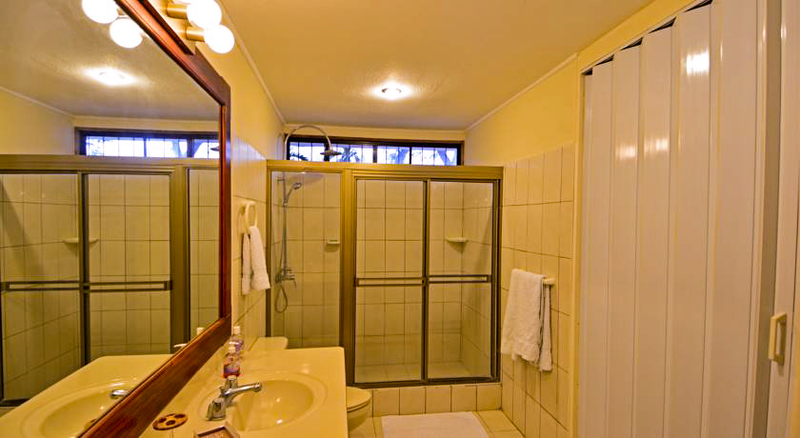 There is no doubt that this property qualifies as a “destination” on its own merits. 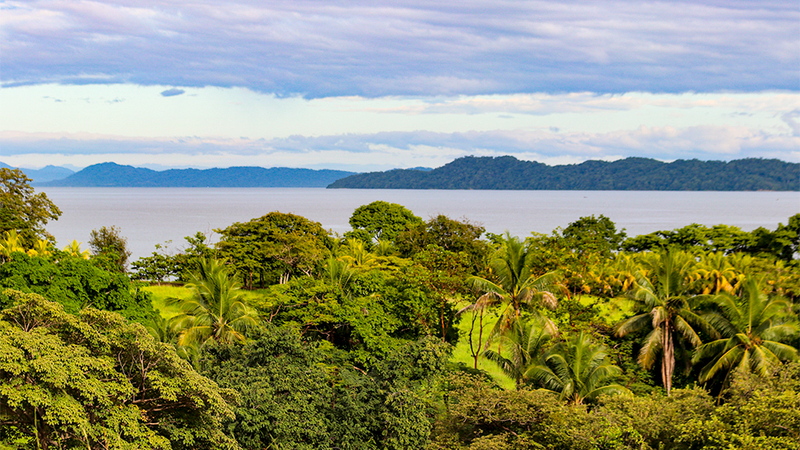 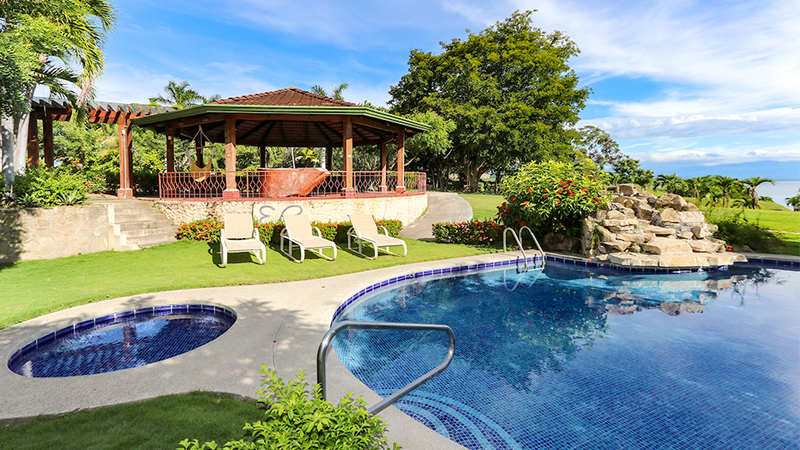 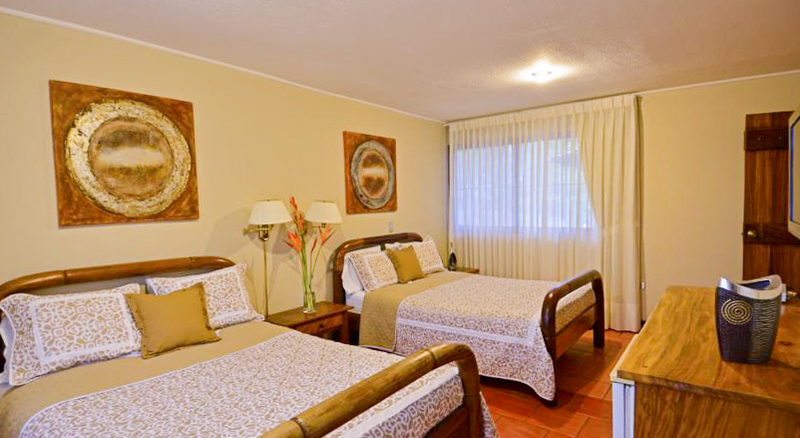 For hospitality business owners, guests will be able to enjoy the best that Costa Rica has to offer – without ever having to leave the grounds: Warm tropical water, a long sandy beach, green riverfront zones, an estuary with mangroves, old growth rainforest populated with wildlife, horseback riding trails, and gorgeous ocean views located throughout the property. 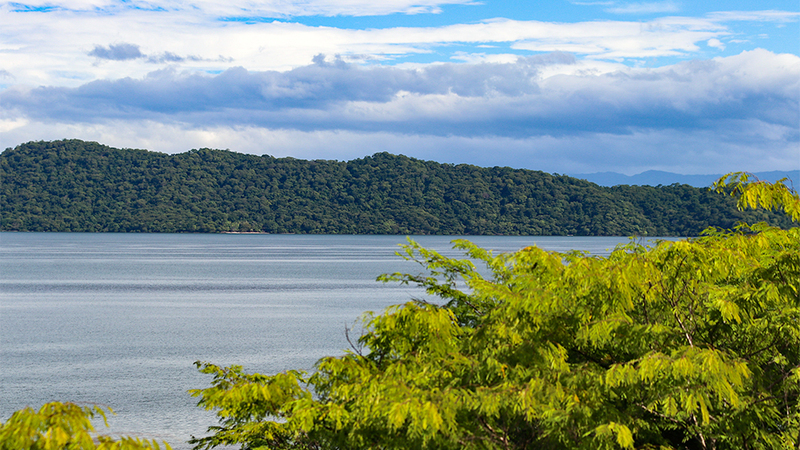 Situated just offshore are the islands of Caballo, Bejuco, and Venado. 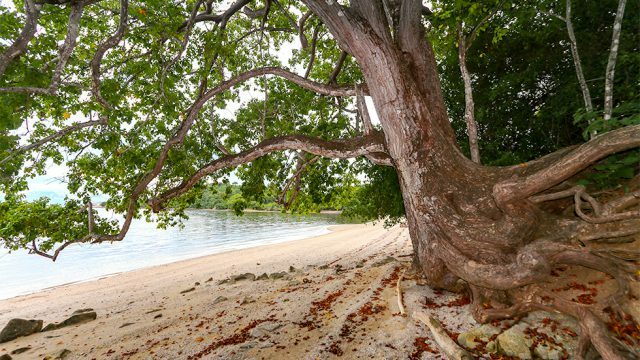 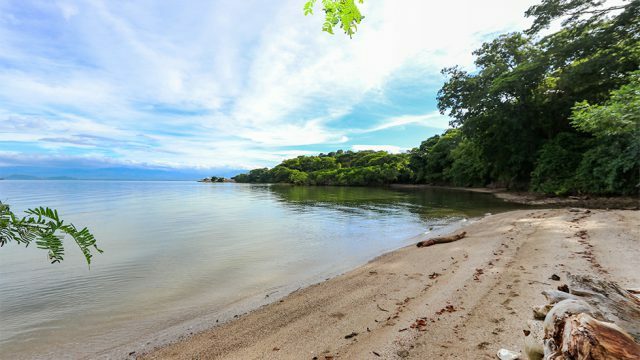 These islands are perfect for exploring by kayak and finding a tropical beach without another soul on it. 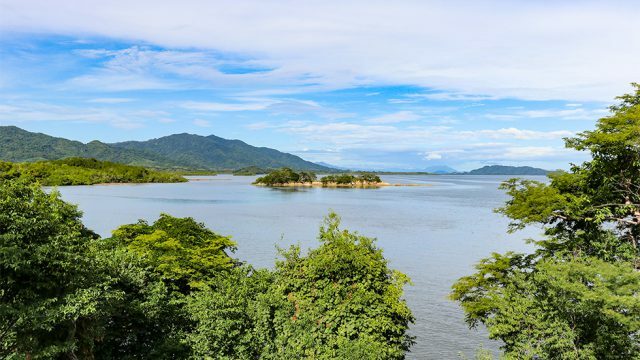 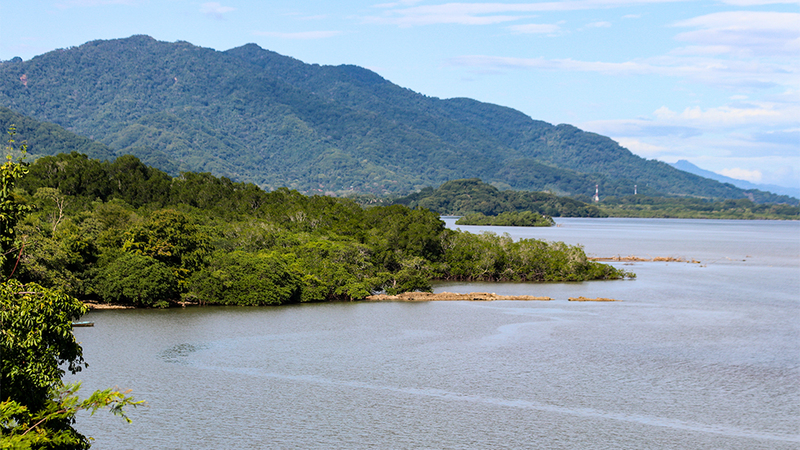 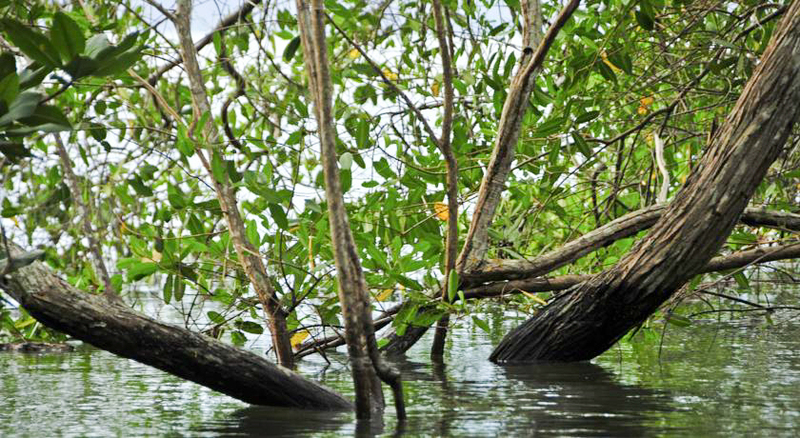 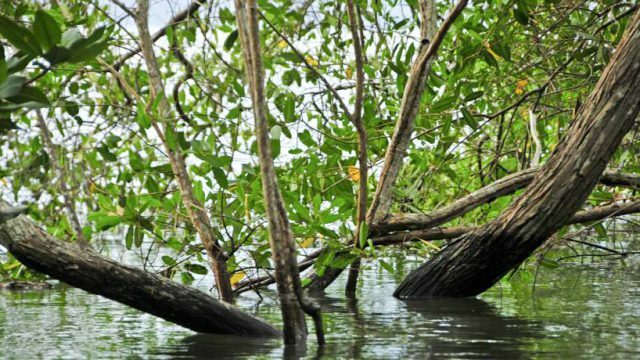 The island mangroves serve as wildlife habitat and excellent fish nurseries, making this specific area a dream come true for fishing and ecotourism. The Gulf was teeming with wildlife: Fish would boil up in circles, furiously jumping into the air for minutes at a time. 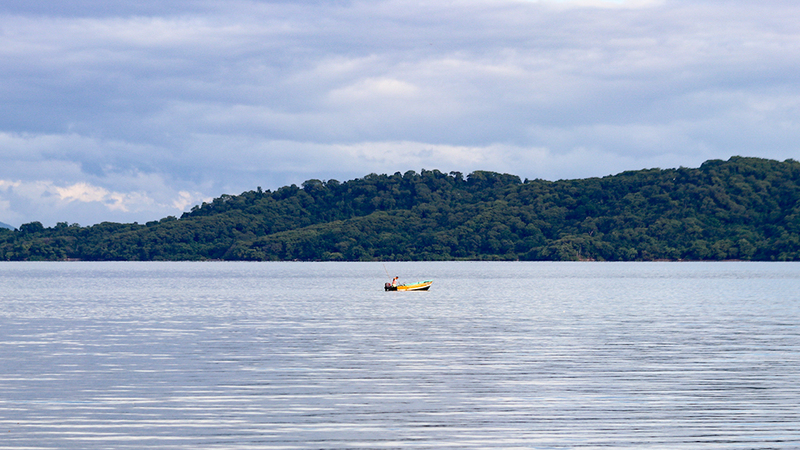 Pelicans and frigate birds pivoted above us or splashed down to retrieve fish. 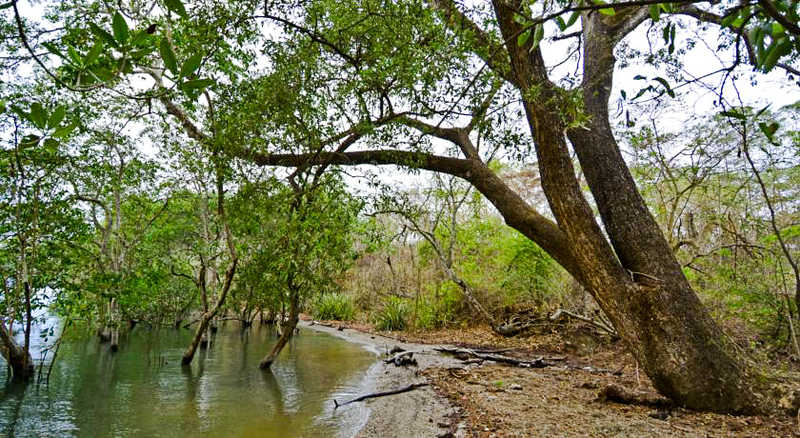 When we paddled close to an estuary, hundreds of herons and seabirds were perched in the trees or flew lazily overhead. Spotted eagle rays leaped into the air and, twice, we paddled close to sea turtles before they dove back into the depths. 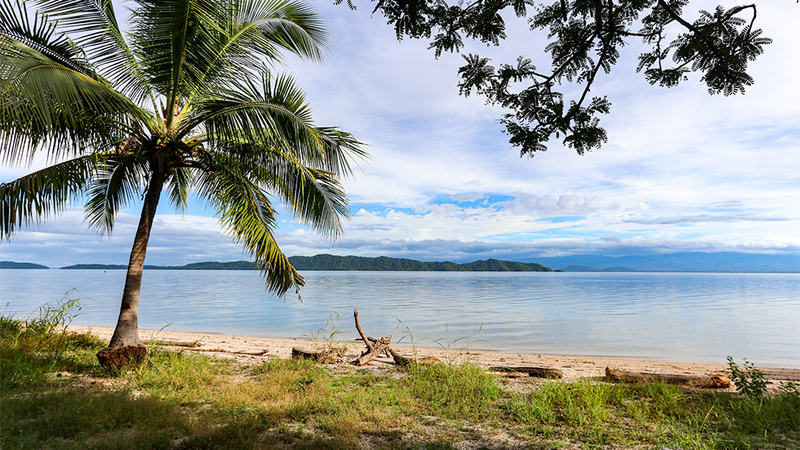 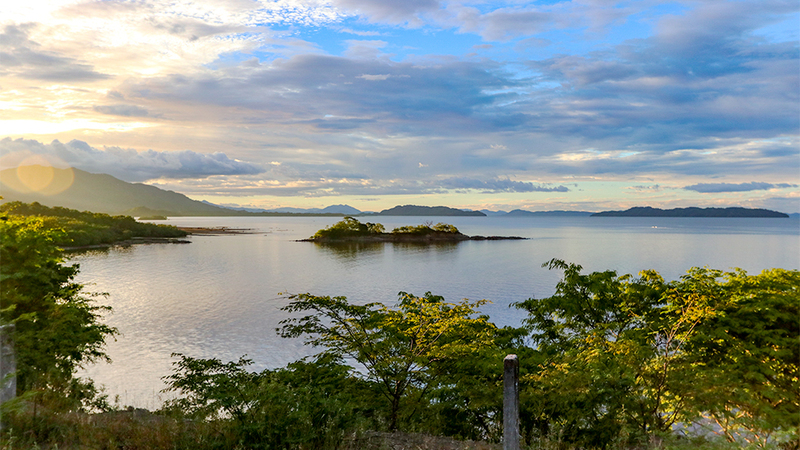 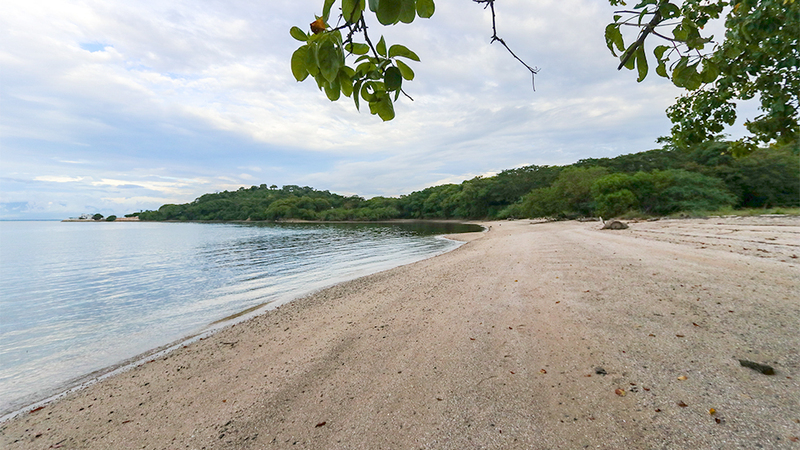 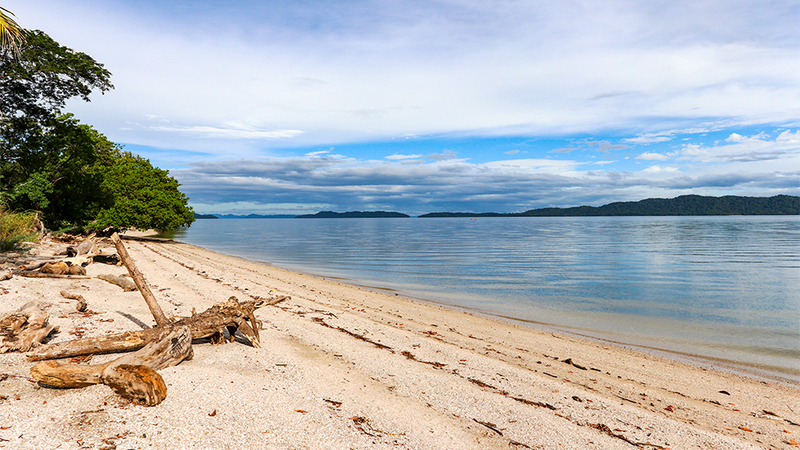 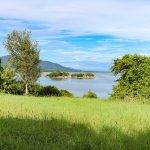 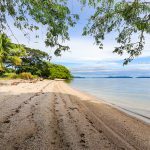 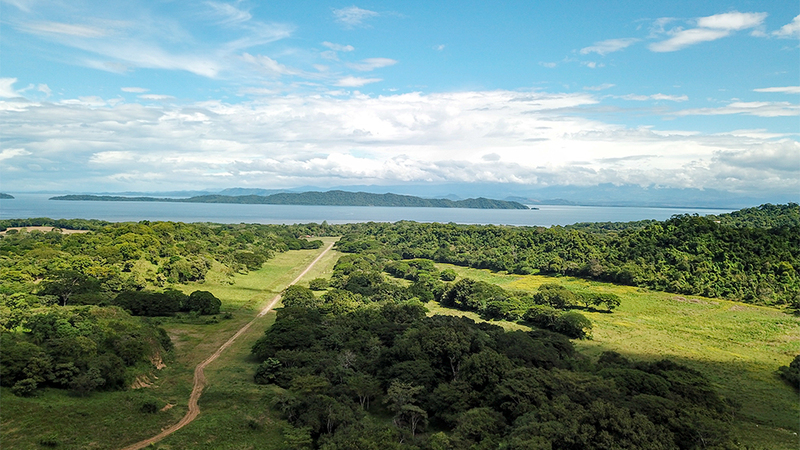 Located about 45 minutes away from the property are the Curu Wildlife Reserve and Tortuga Island, one of Costa Rica’s most popular islands to visit. 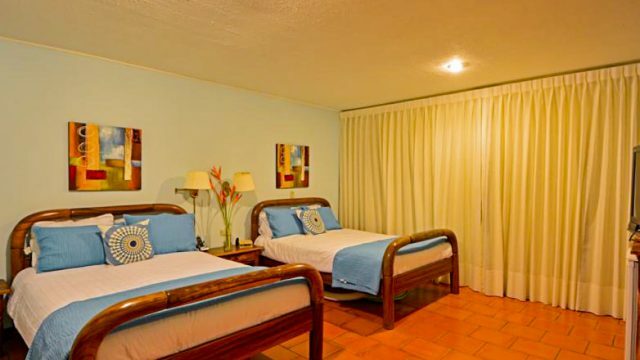 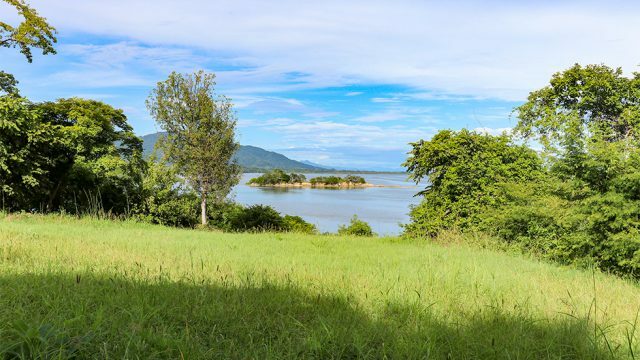 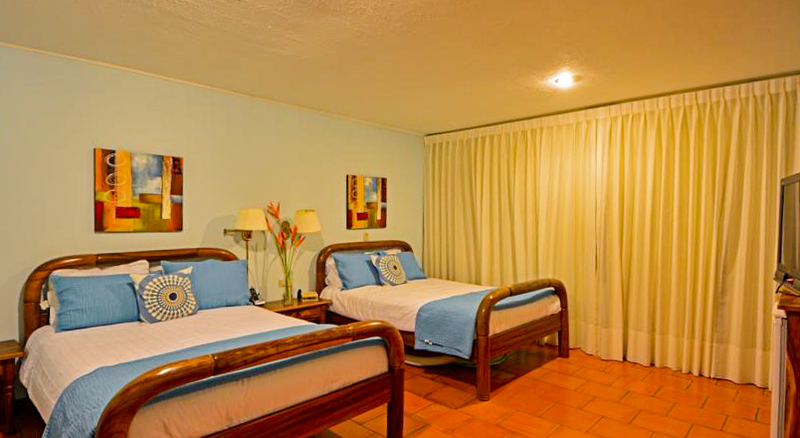 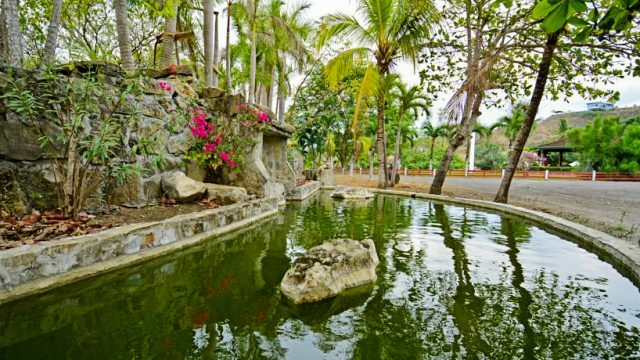 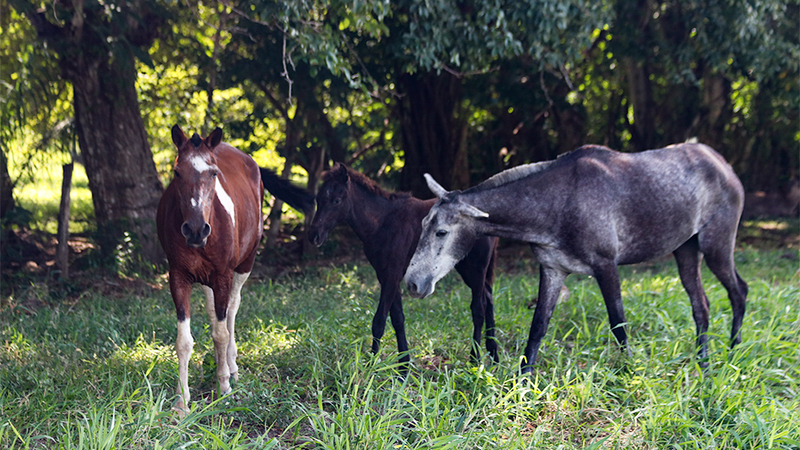 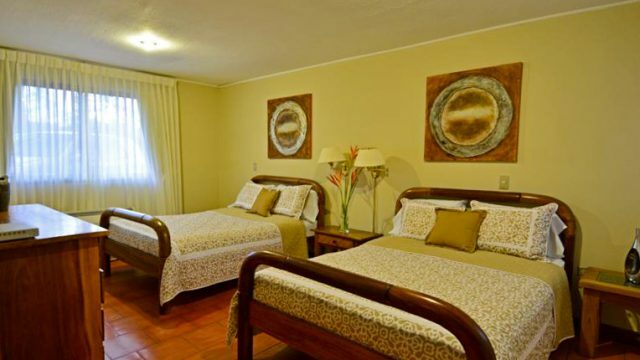 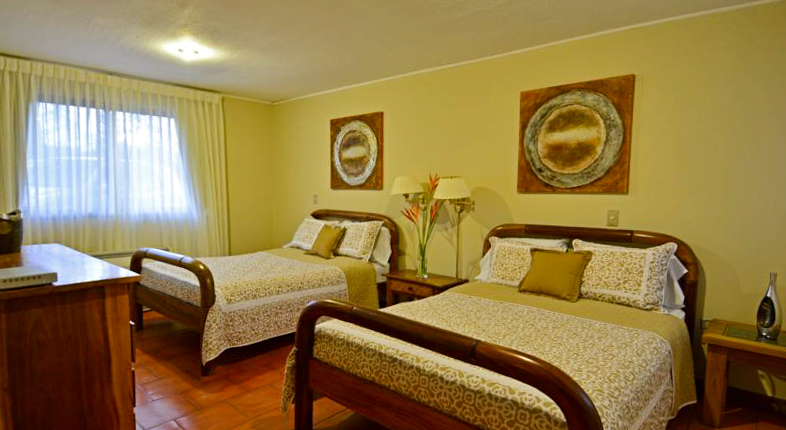 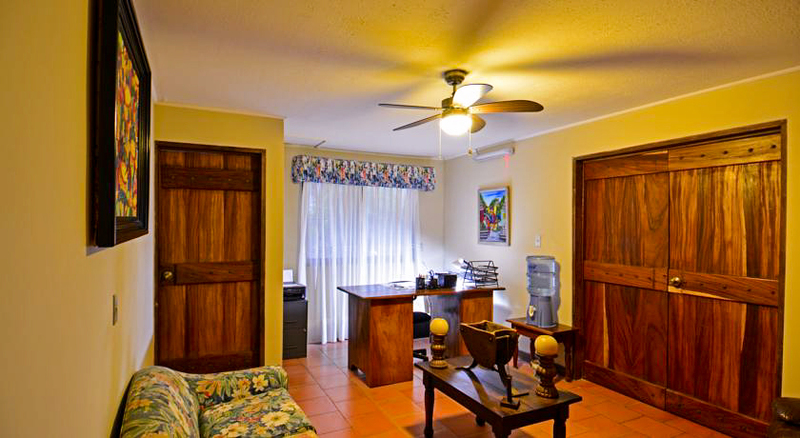 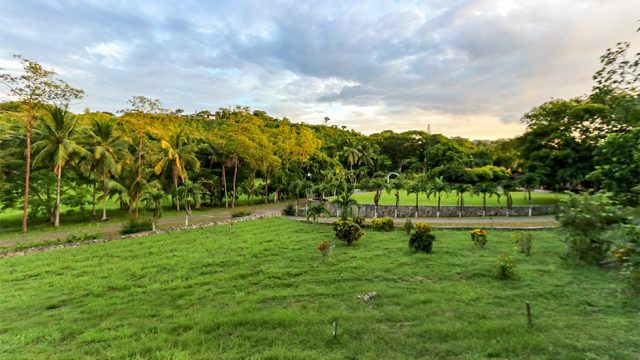 Here guests can enjoy nature hiking, wildlife sightings, zip lining, horseback riding, kayaking, snorkeling, and diving. 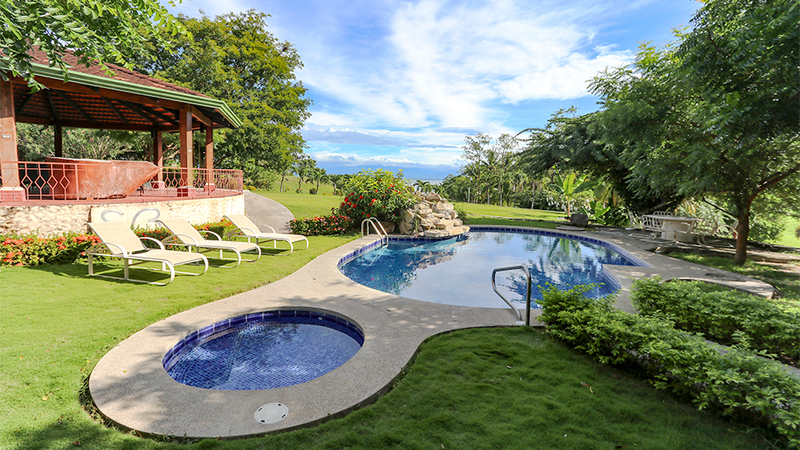 Most of these activities can be done right from the property itself, but it is beneficial to operate a hospitality business or develop homes, from a location where guests can take interesting day trips without having to travel too far. 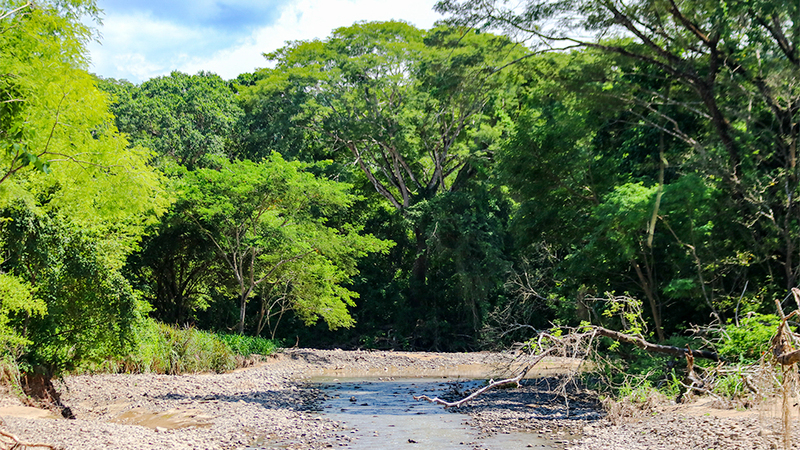 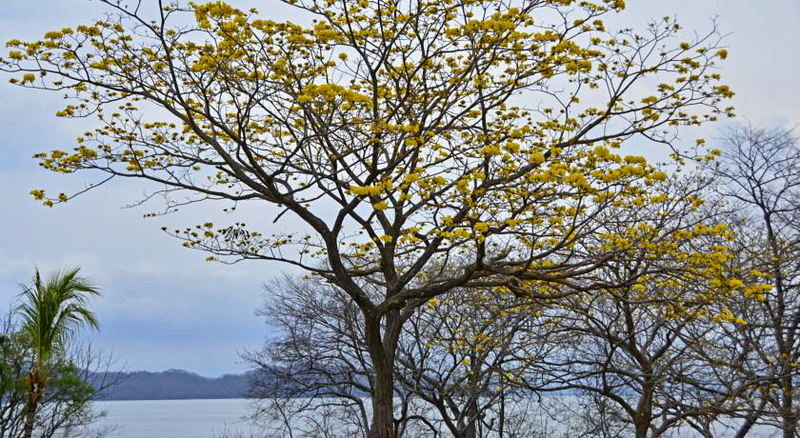 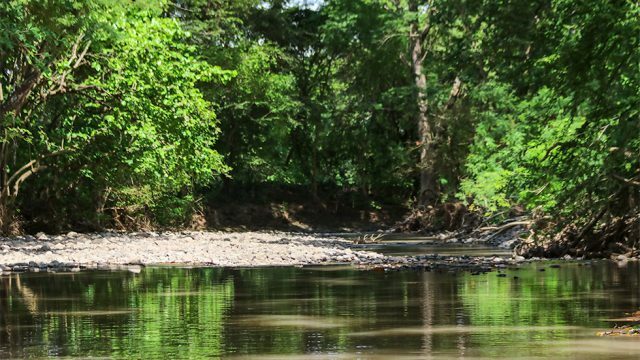 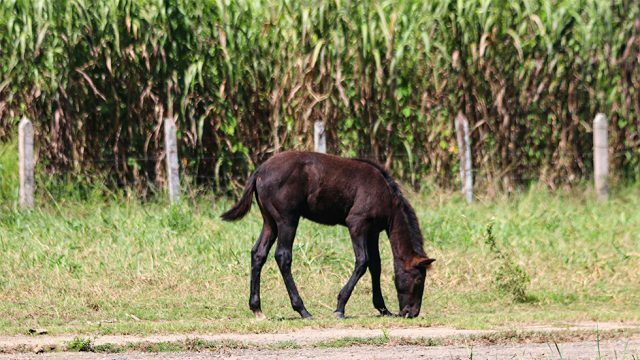 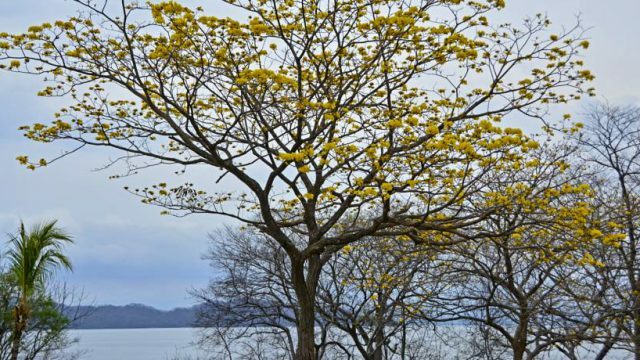 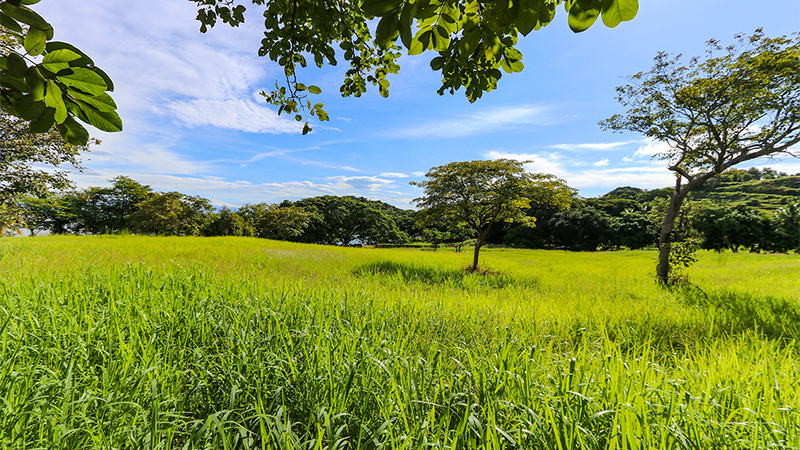 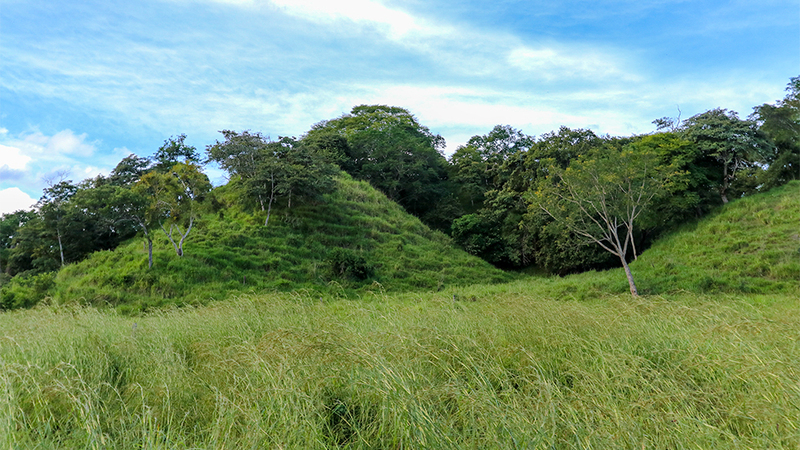 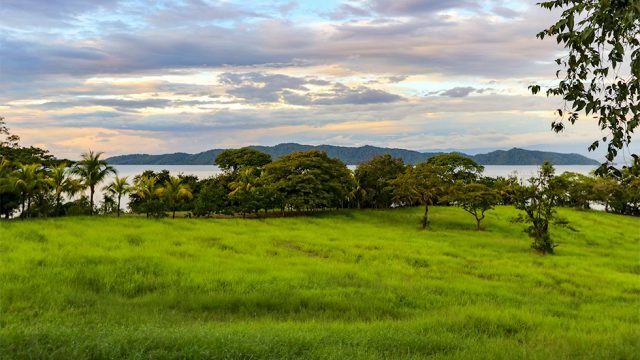 Also within a 2-hour drive radius, trips can be made to Tambor, Santa Teresa, Mal Pais, Montezuma, Cabo Blanco Nature Reserve, and other destinations around the Nicoya Peninsula. 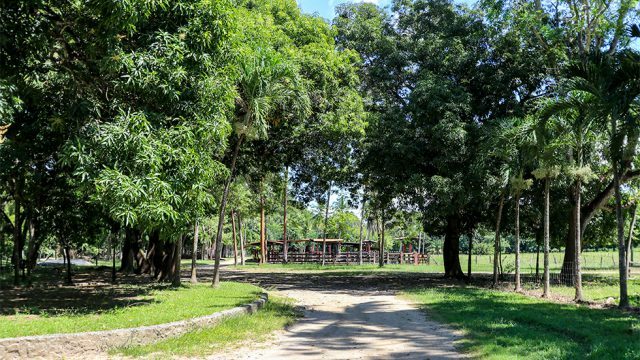 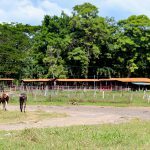 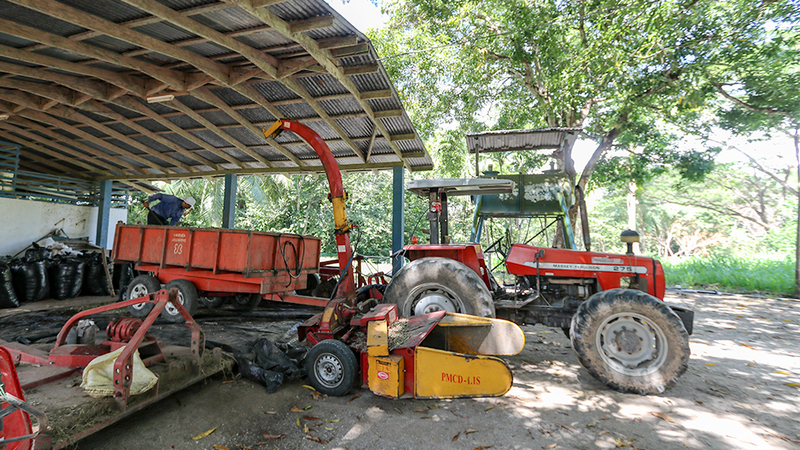 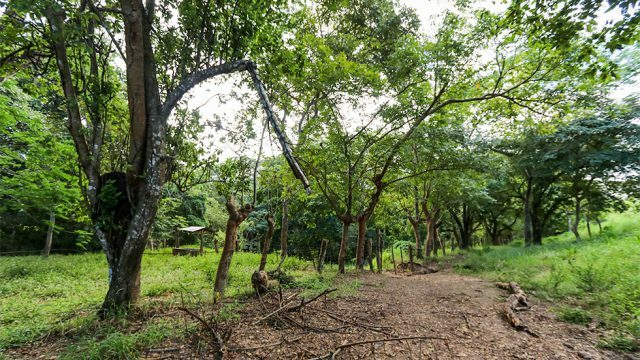 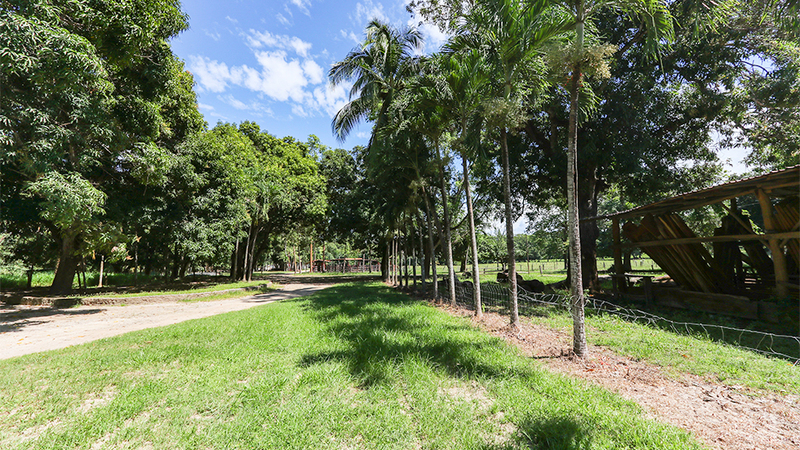 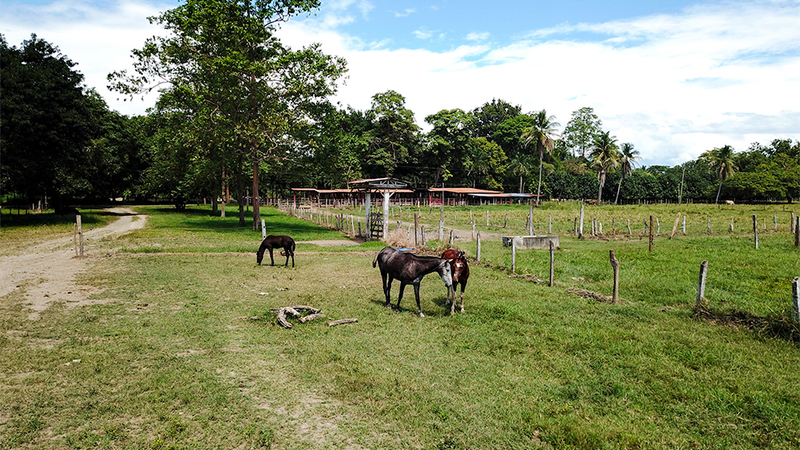 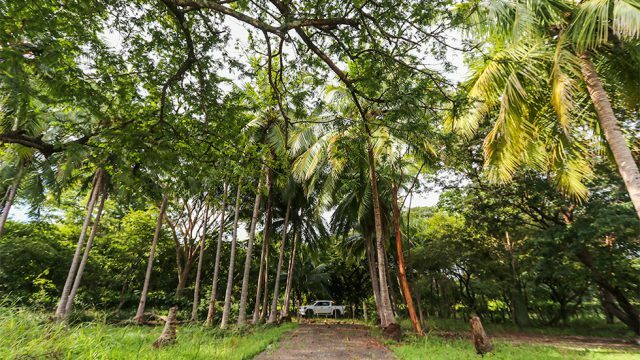 The Farm – The property currently operates as a fully functional cattle ranch and agricultural farm. 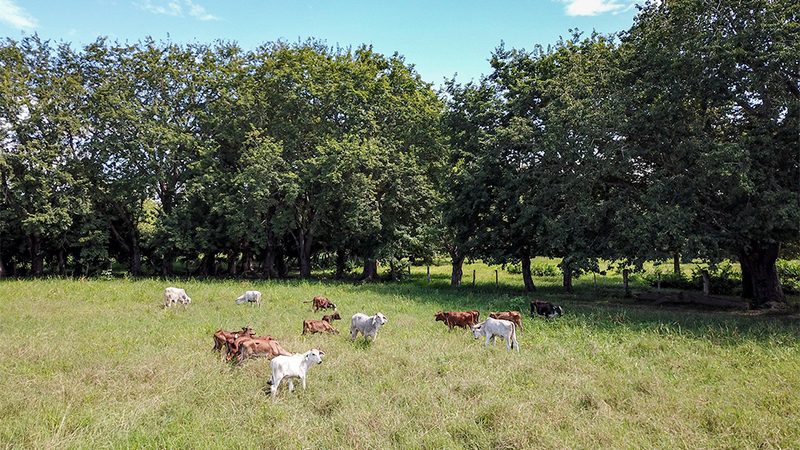 Over 300 head of cattle and 250 sheep currently graze on over 400 hectares of pasture grass on the property. 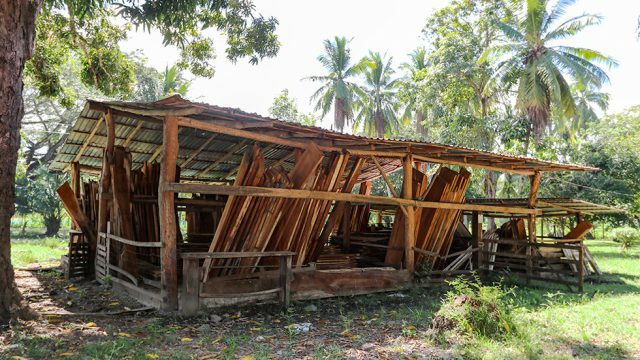 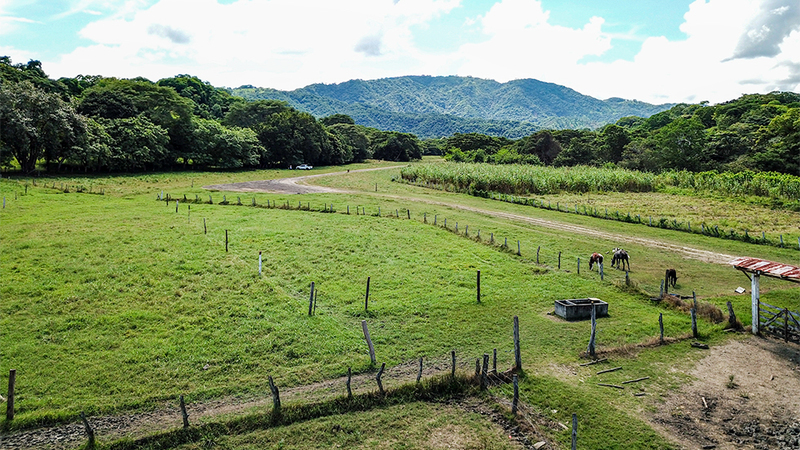 Rich in resources and infrastructure, the property includes an abundant water supply (rivers, creeks, 6 wells), hardwood lumber, road paving material, internal roads, horse corrals, agricultural fields, fruit trees, livestock pens, and structures to store farming equipment. Livestock and farming equipment are negotiable. 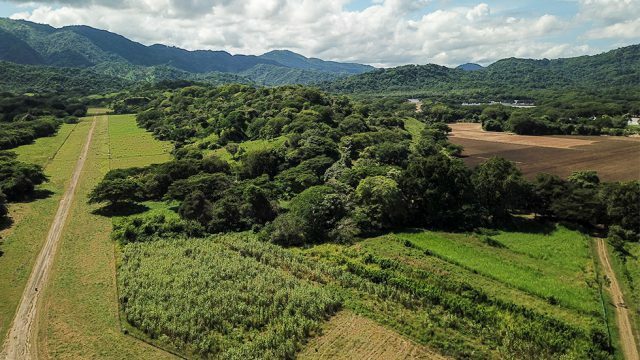 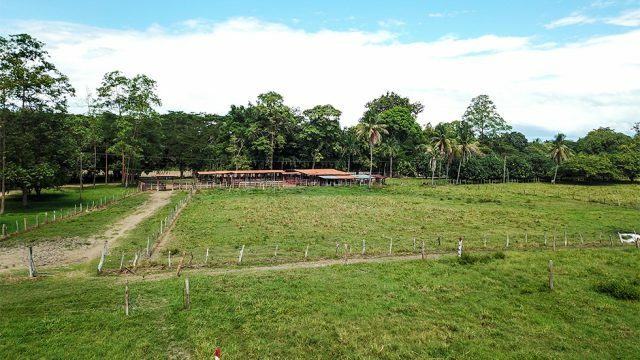 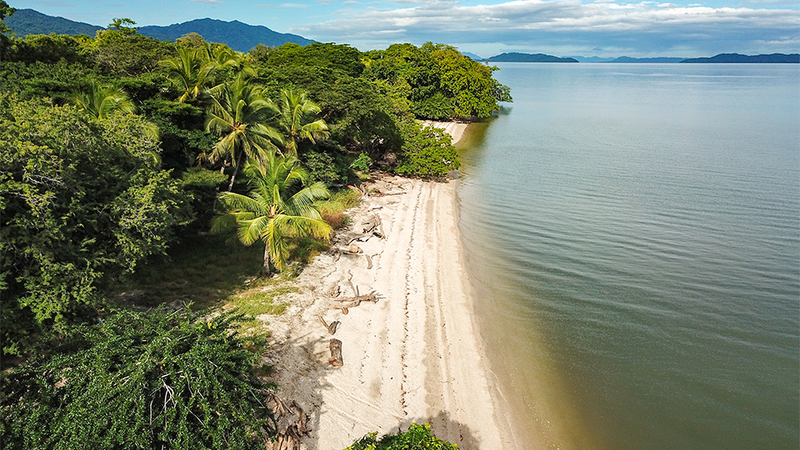 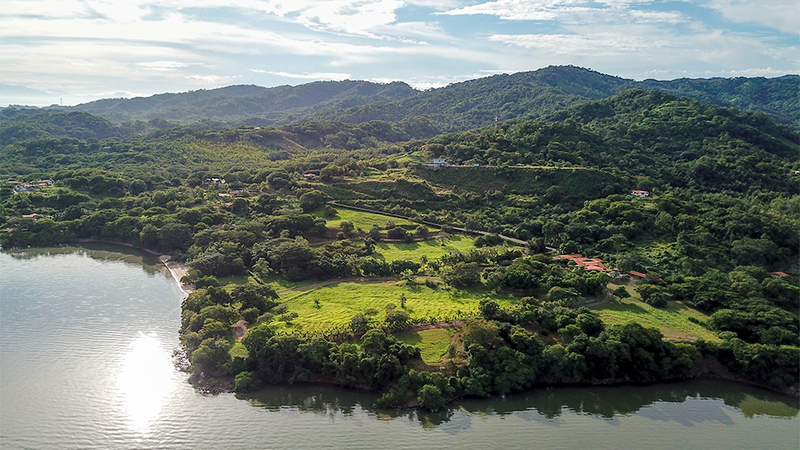 The topography of the farming portion of the property features green riverfront zones and open pastures that gently transition into rolling hillsides with beautiful ocean views and back towards mountains covered with old growth rainforest that serve as a natural wildlife corridor. 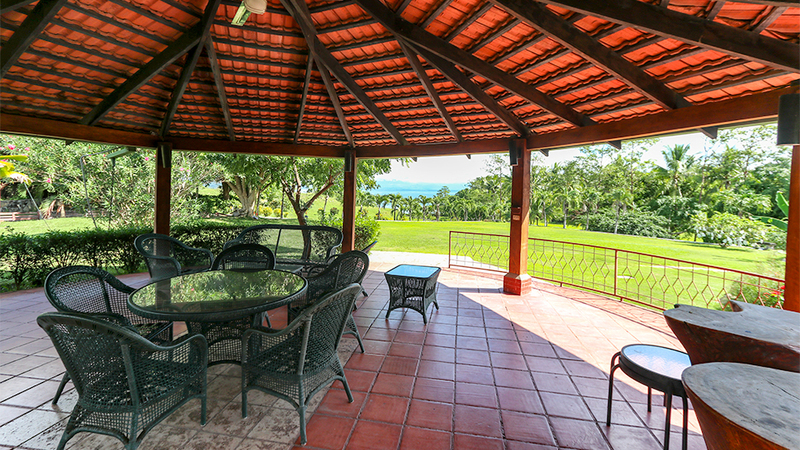 The Oceanfront Estate – The beachfront portion of the property features palm-lined internal roads that lead to a long sandy beach, a river mouth estuary with mangroves, huge expansion areas for homes or casitas with gorgeous ocean views, and a spacious 13 bed / 12 bath estate home that can be converted into a boutique hotel immediately. 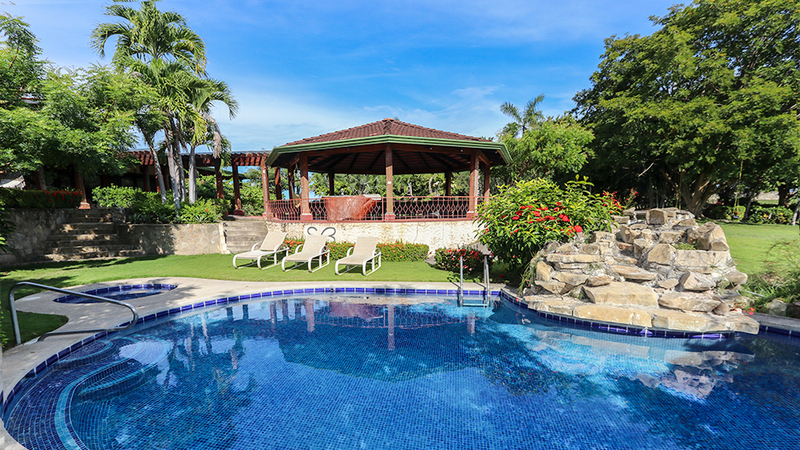 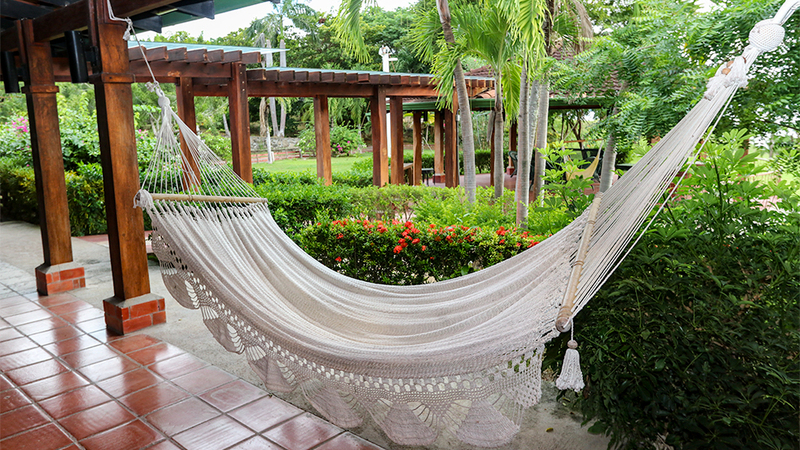 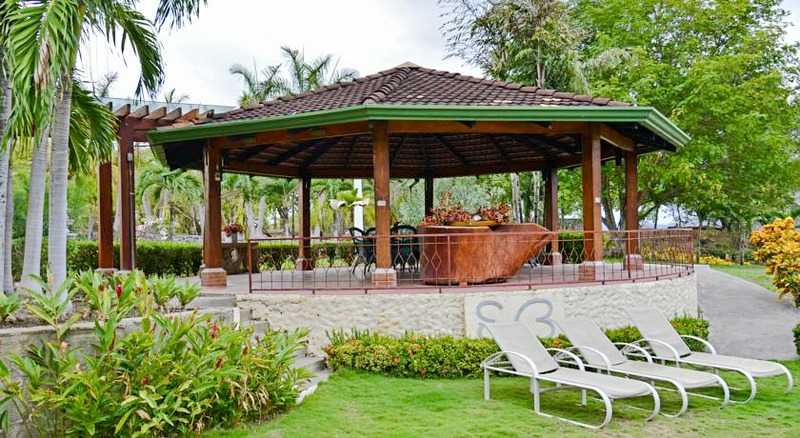 The Hacienda includes covered lounge areas, outdoor dining, an industrial-sized kitchen, a pool with jacuzzi, beautifully landscaped gardens and an ocean view pavilion for outdoor entertaining. 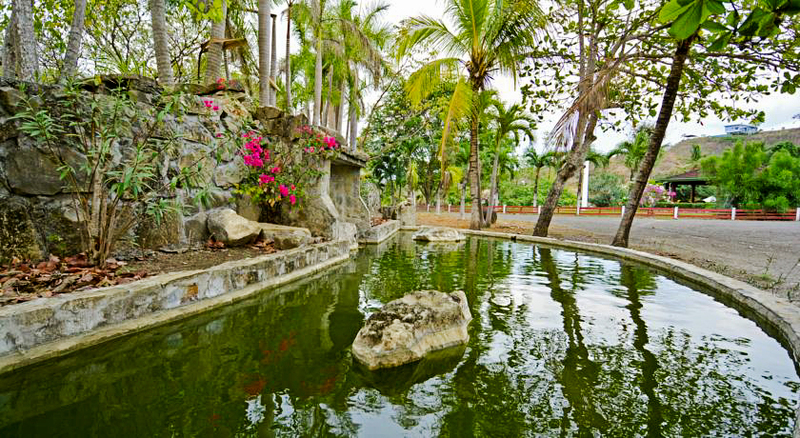 Other infrastructure includes a greenhouse, fountains, extensive stonework, concrete driveway, ample parking, water storage, boat storage, and a separate 2 bedrooms / 1 bath caretaker’s home. 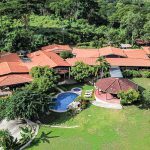 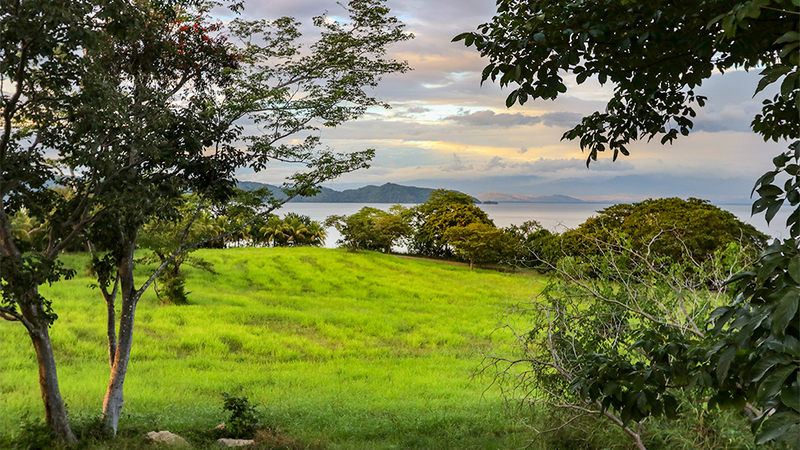 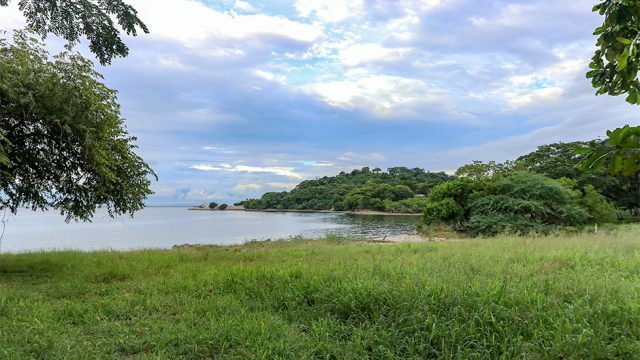 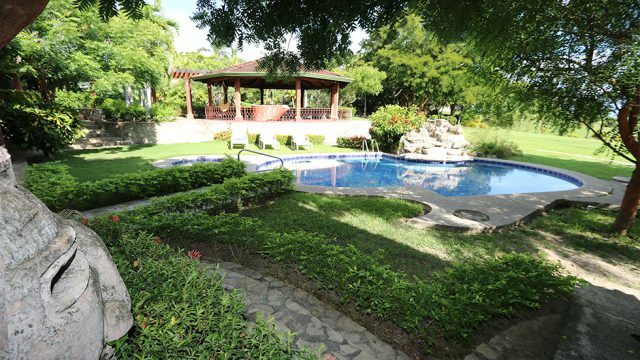 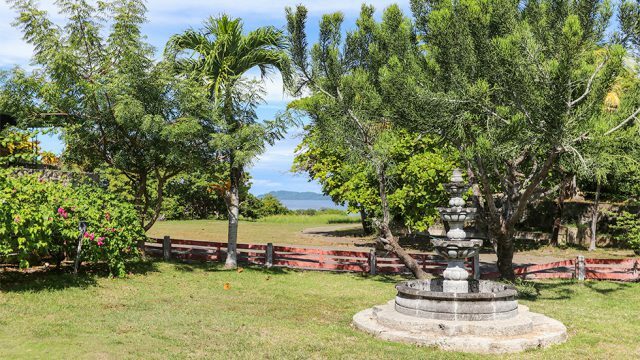 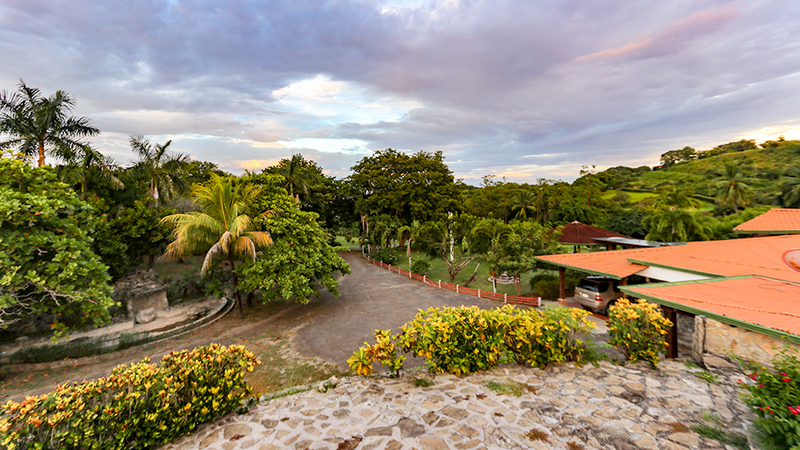 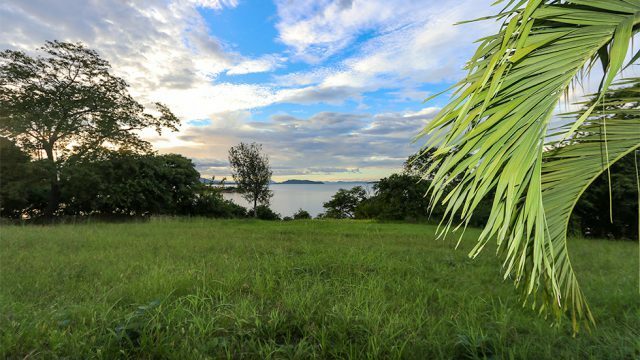 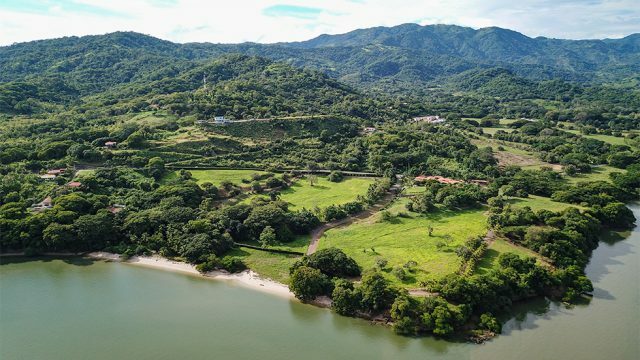 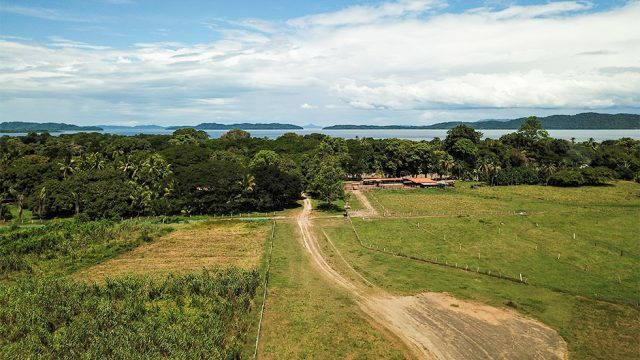 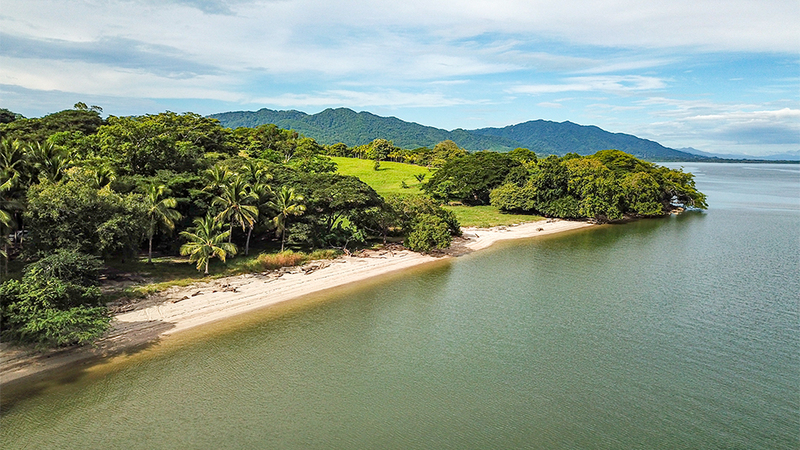 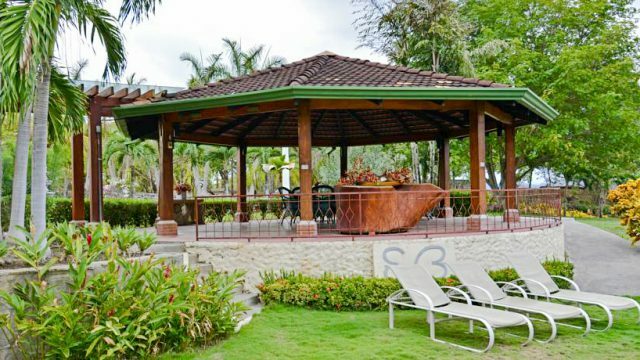 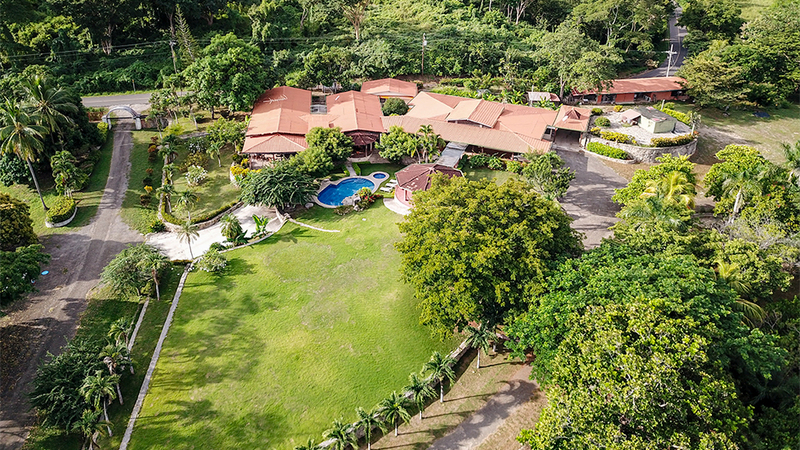 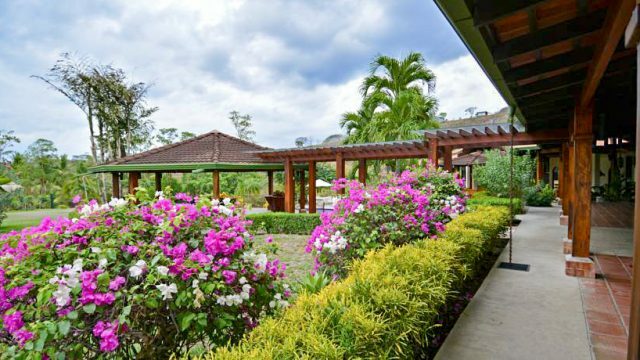 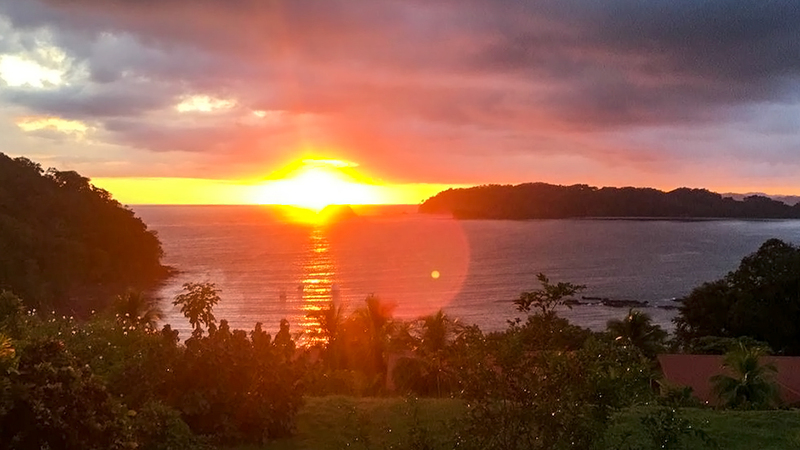 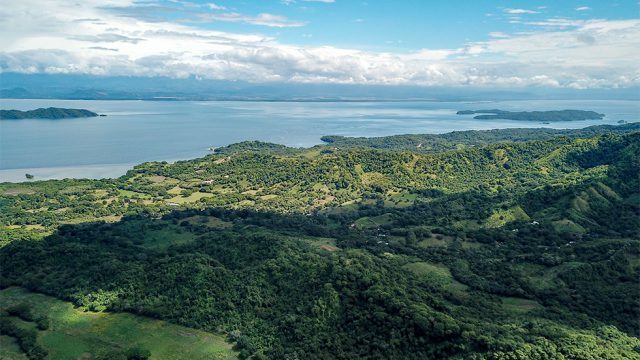 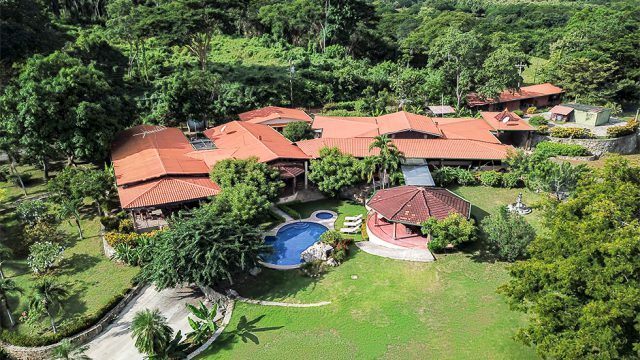 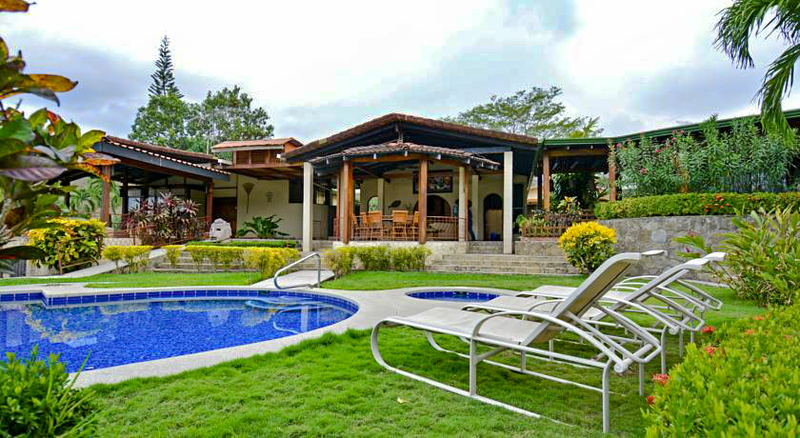 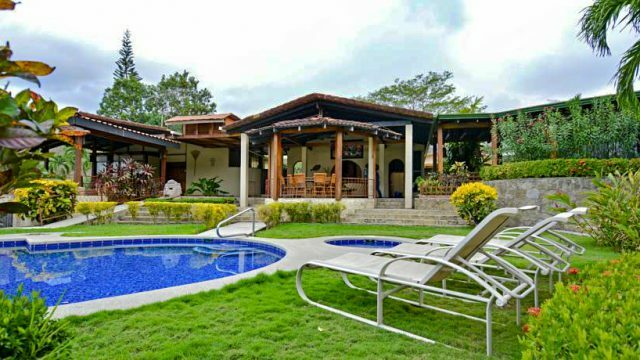 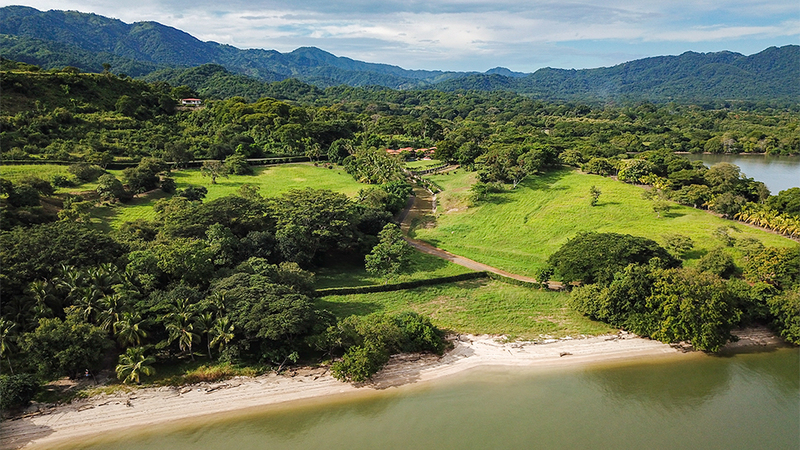 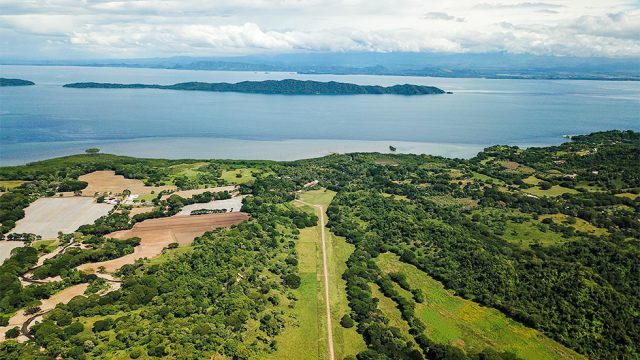 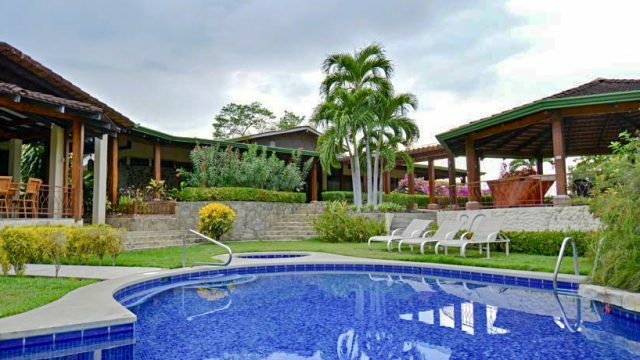 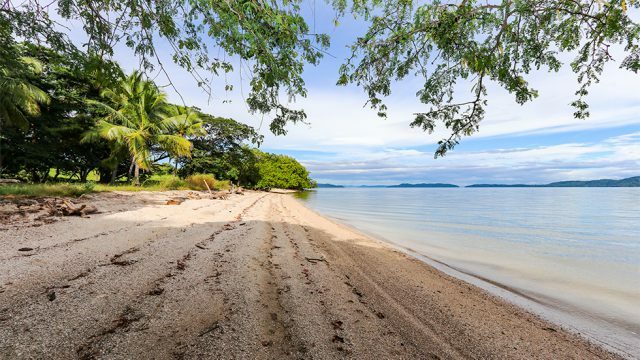 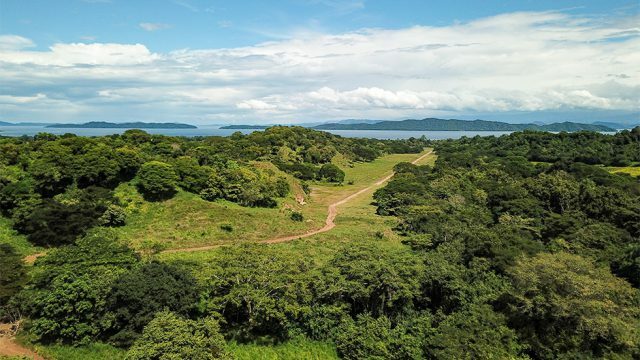 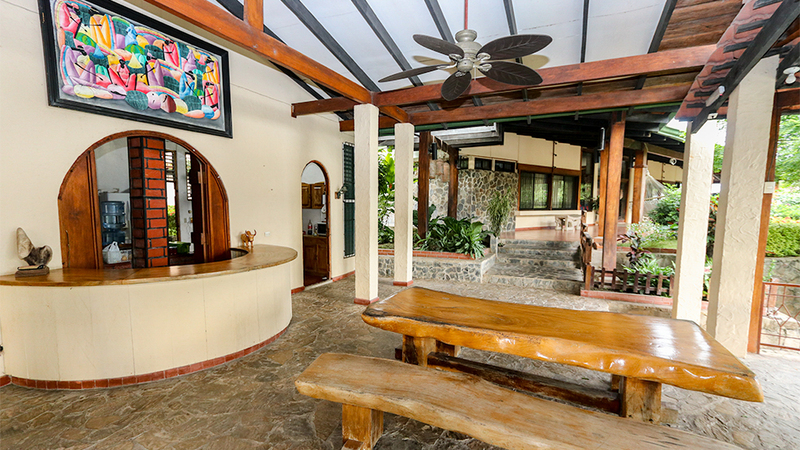 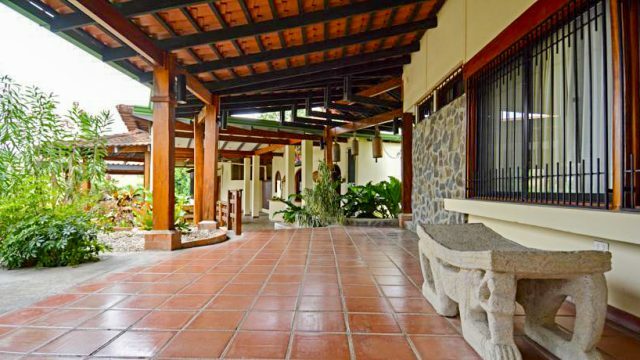 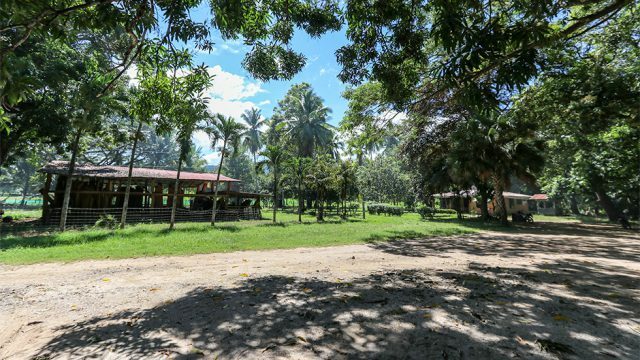 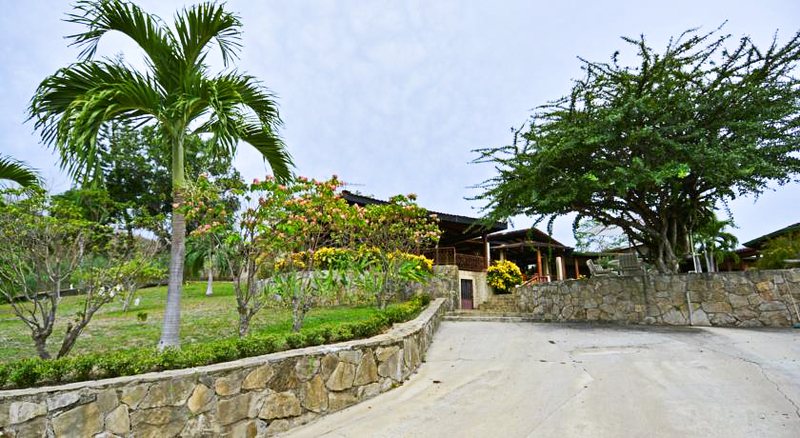 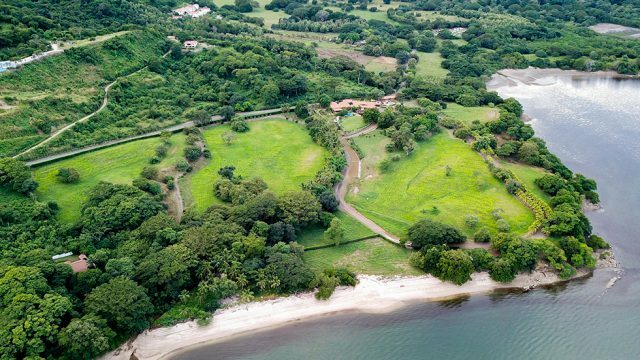 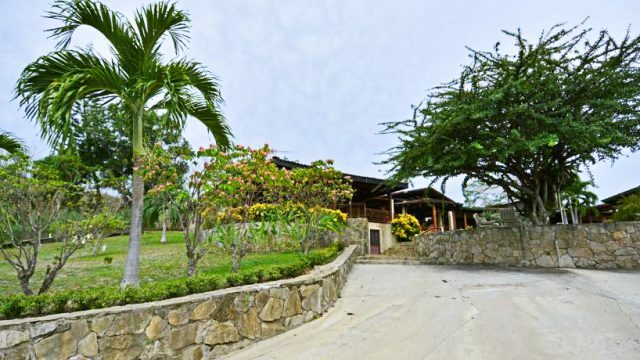 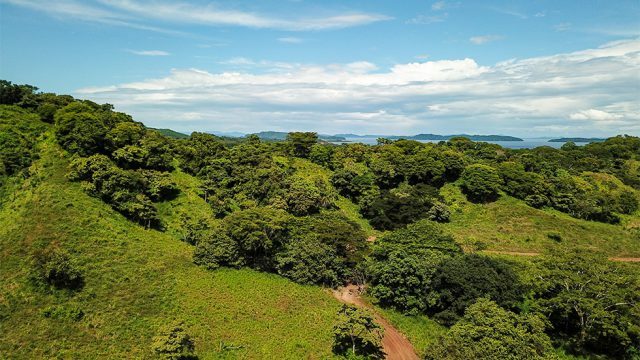 This is one of the rare beachfront properties in Costa Rica that is fully titled with no need for concession renewal with the Costa Rican government. 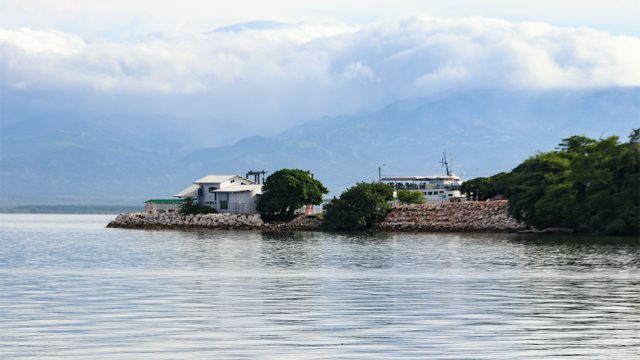 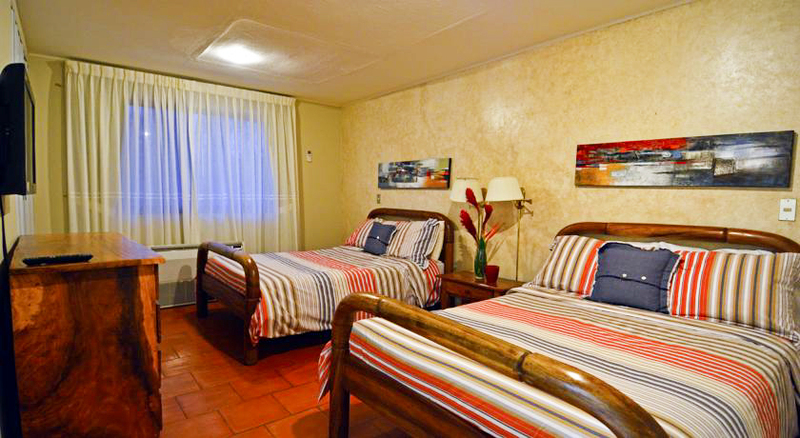 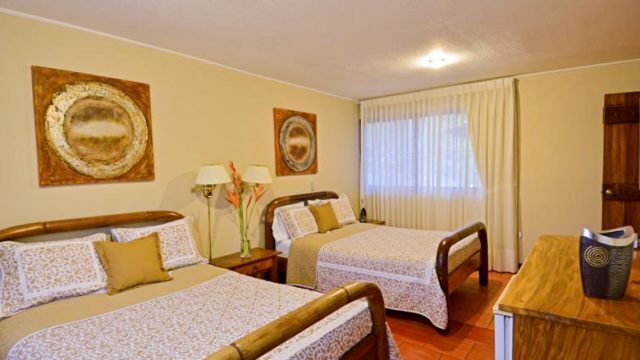 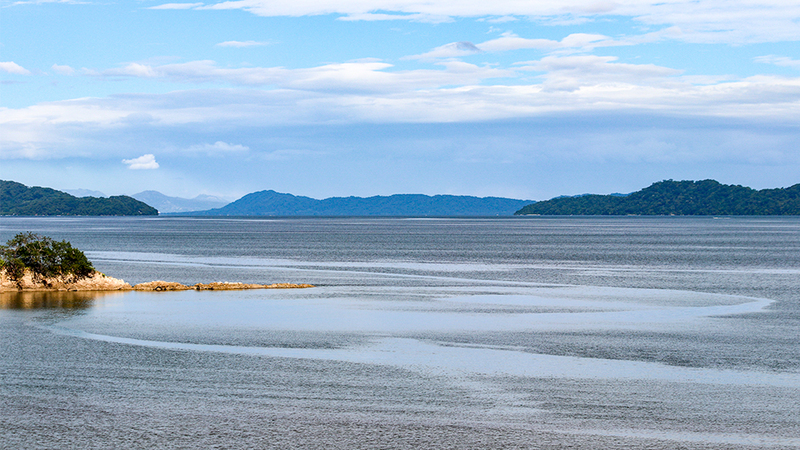 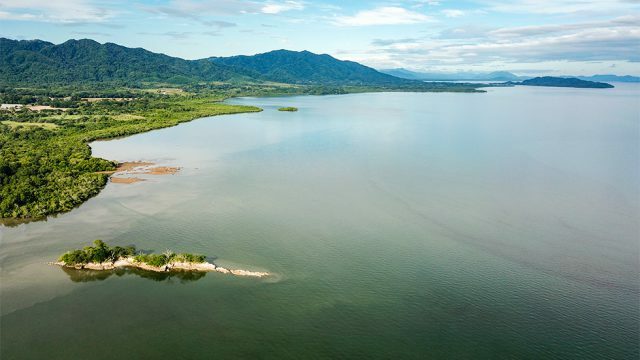 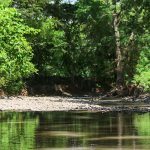 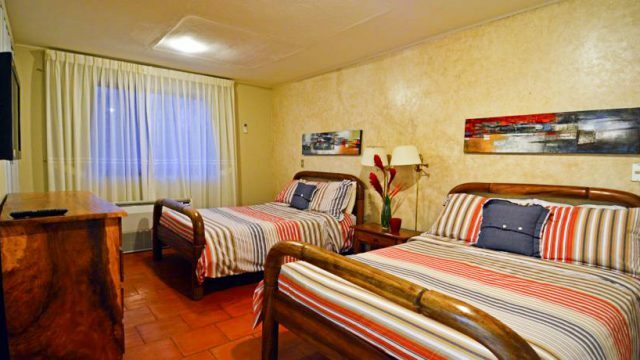 Only 800 meters from the Playa Naranjo Ferry – With four round trips per day from the town of Puntarenas, guests can arrive on the ferry with their rental vehicles, or get picked up directly from the ferry terminal. 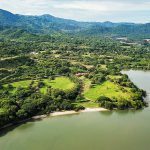 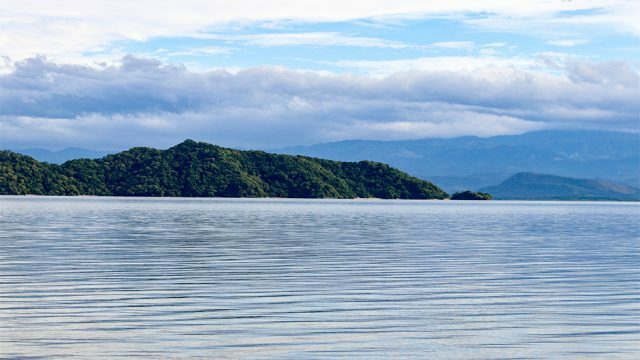 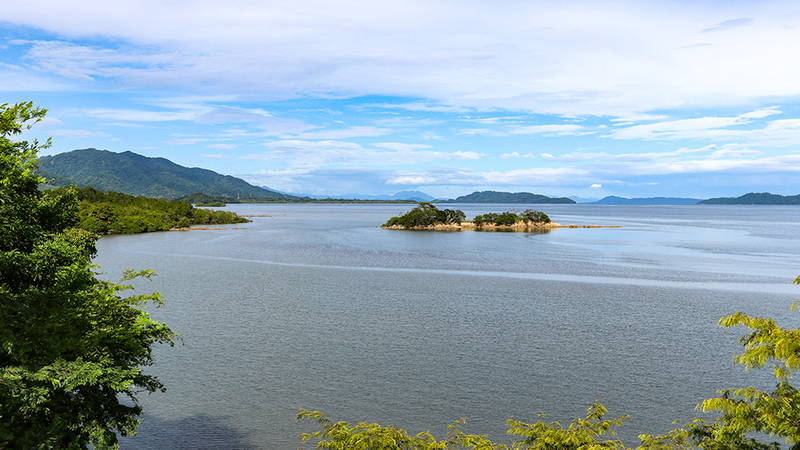 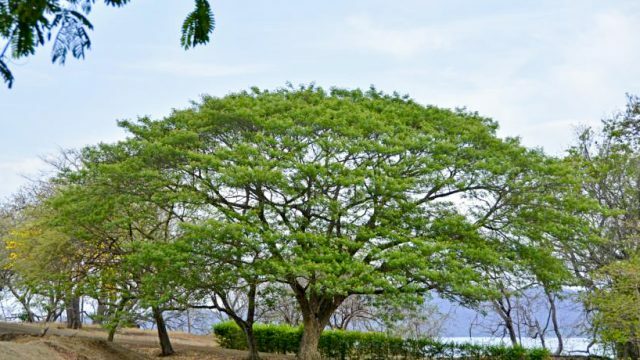 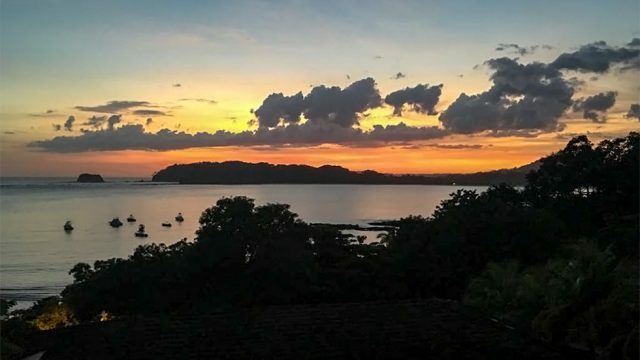 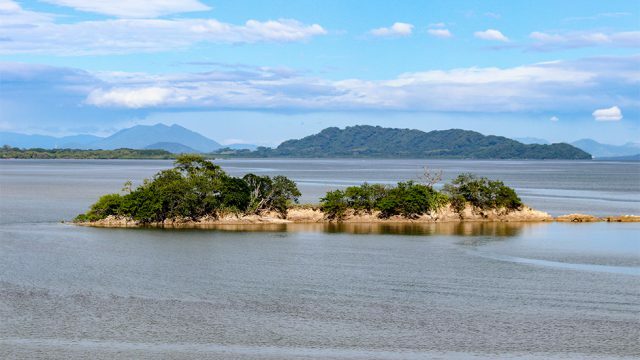 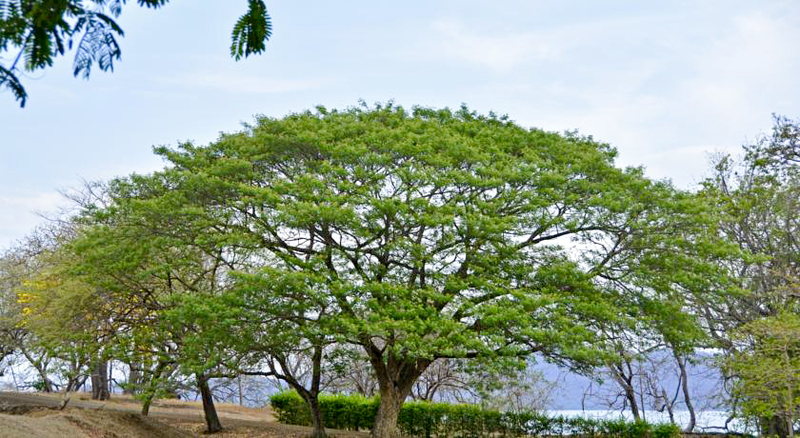 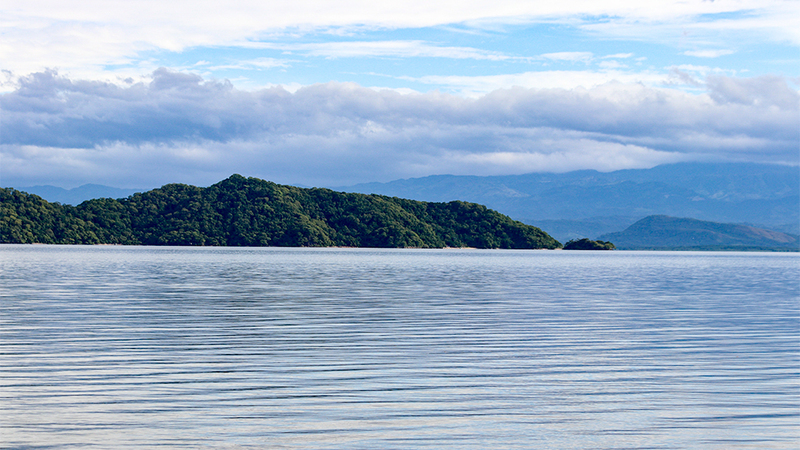 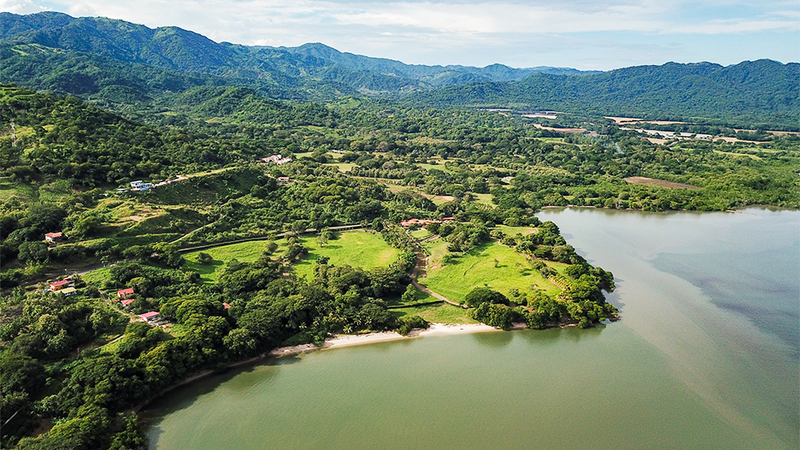 The 70-minute ferry ride breaks up the drive from the Juan Santamaria International Airport and provides a wonderful opportunity to relax and enjoy the scenic views of the Nicoya Peninsula. 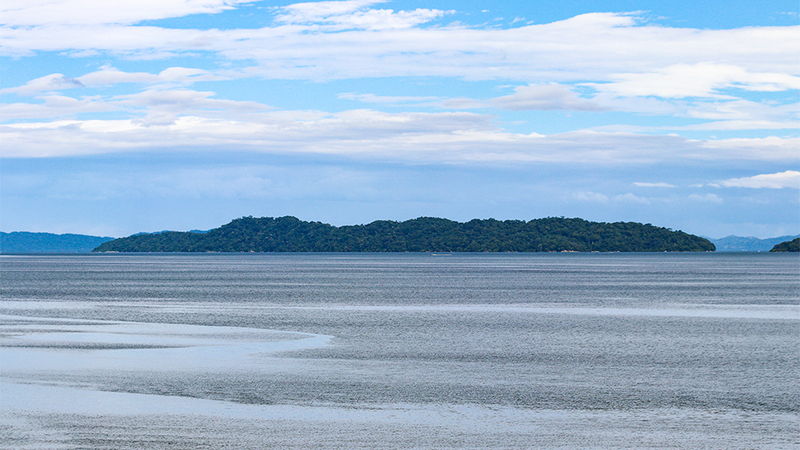 The journey will take you past pristine islands in the gulf, most of which are protected biological reserves. 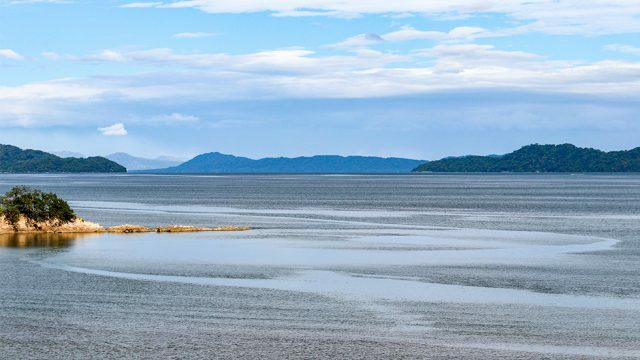 For those familiar with the Pacific Northwest, the trip feels reminiscent of taking the ferry from Seattle over to the San Juan Islands – except the trip is a lot warmer and more comfortable! 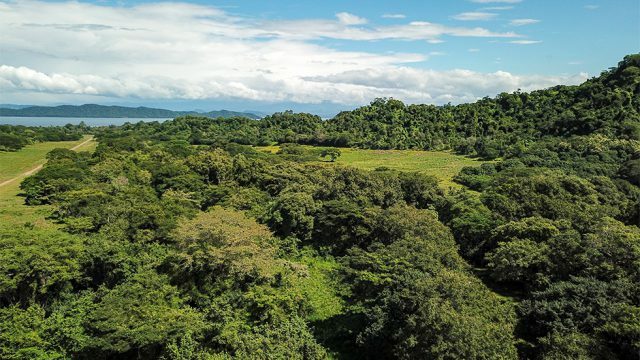 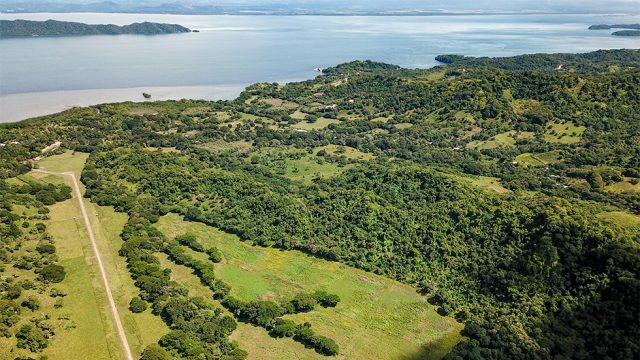 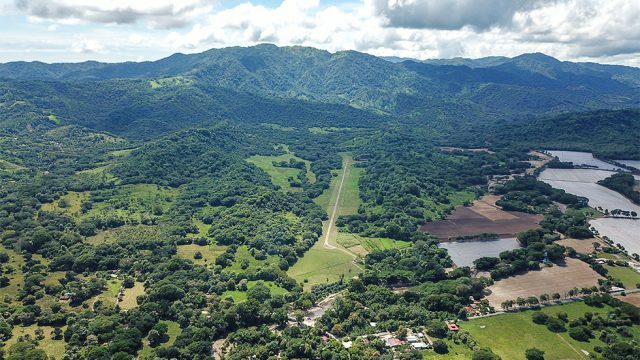 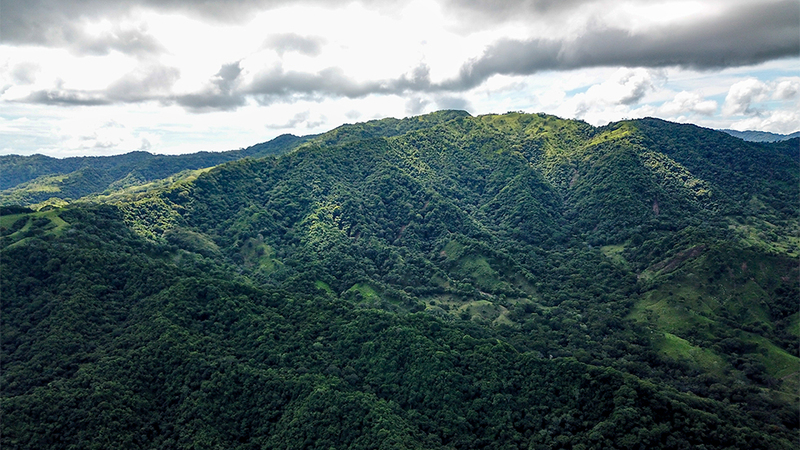 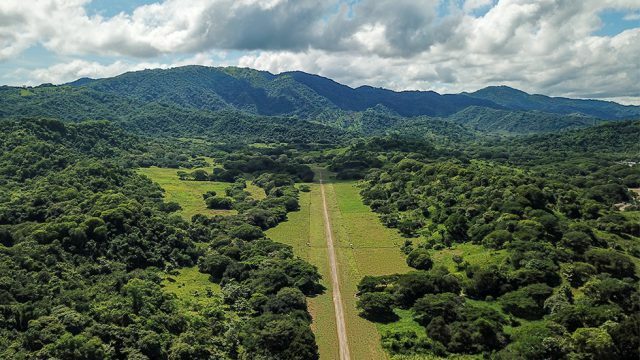 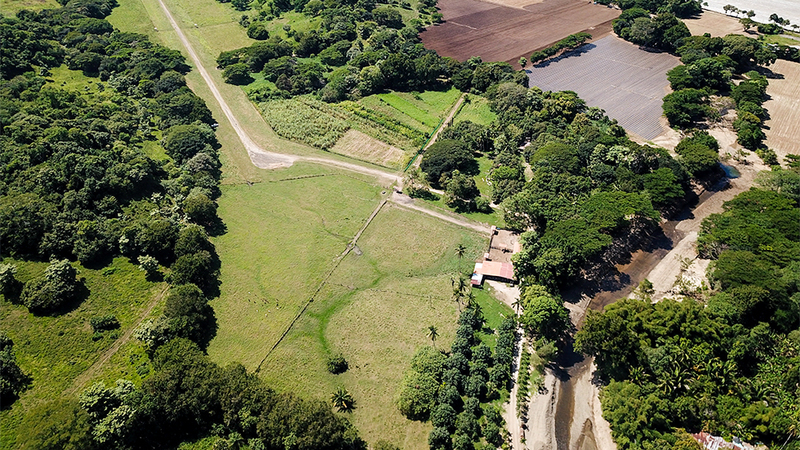 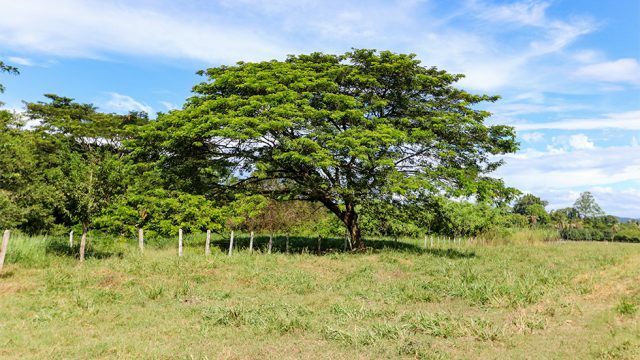 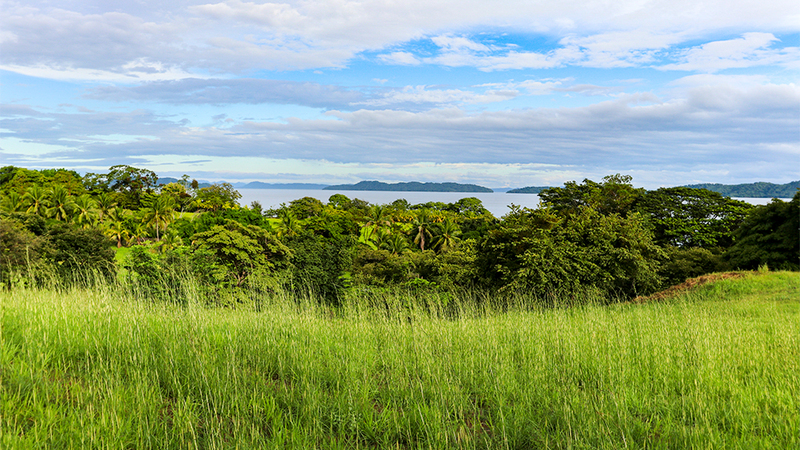 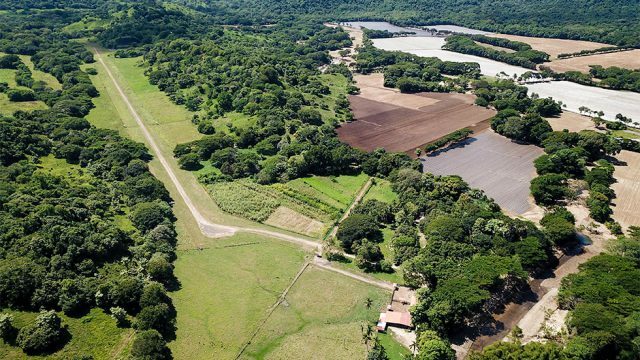 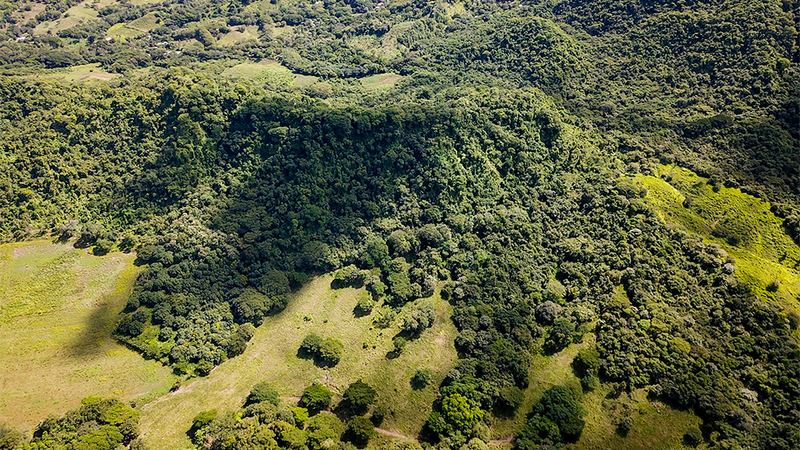 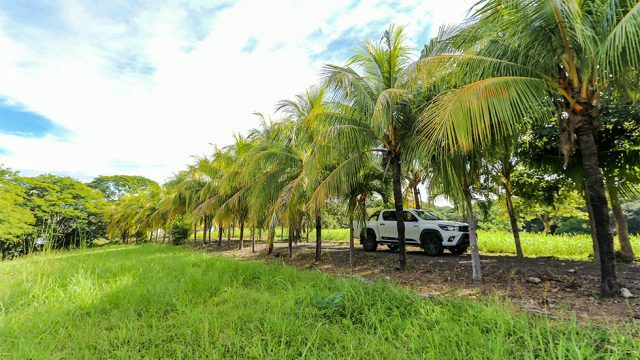 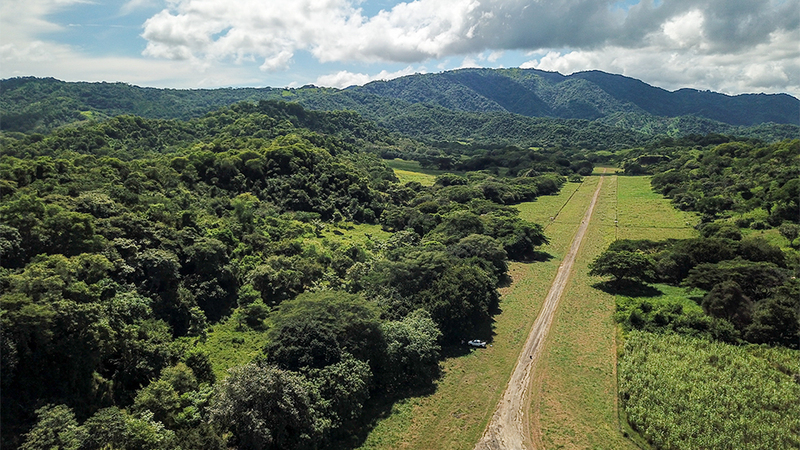 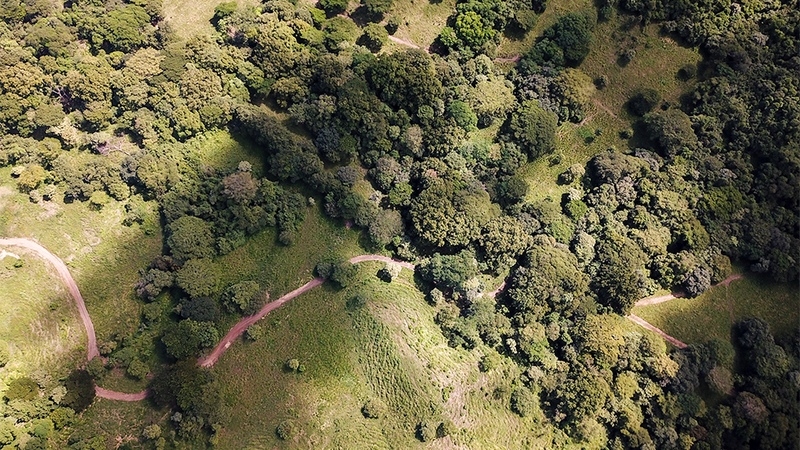 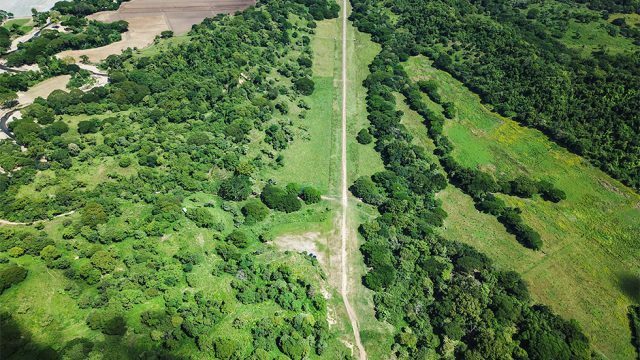 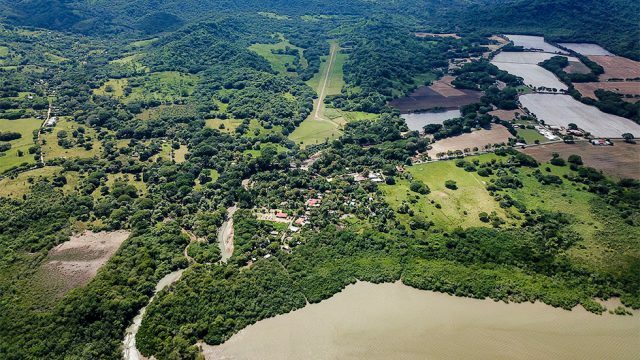 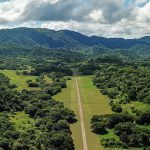 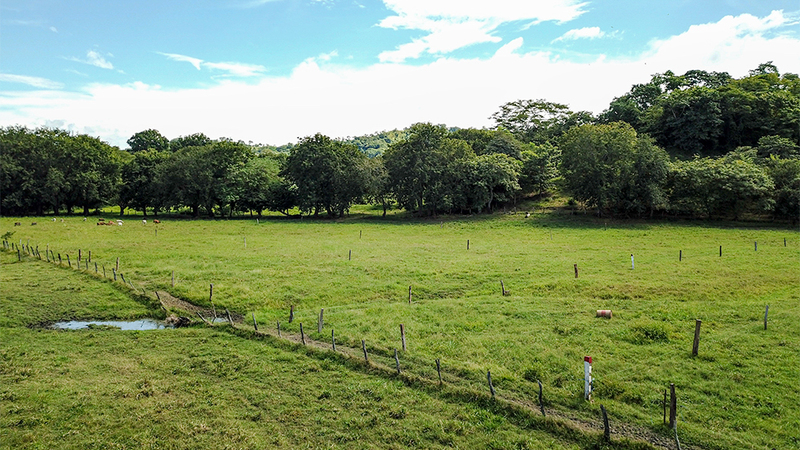 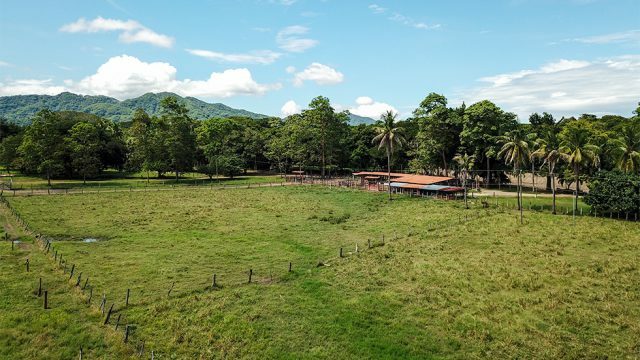 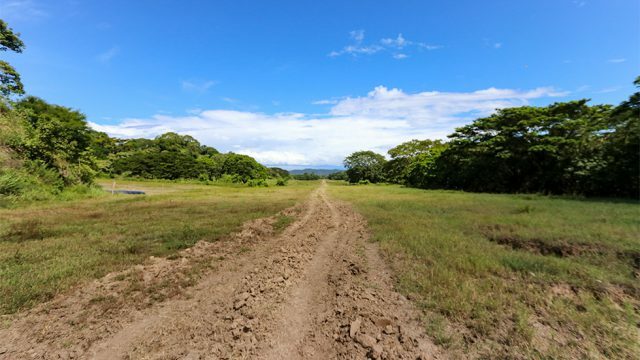 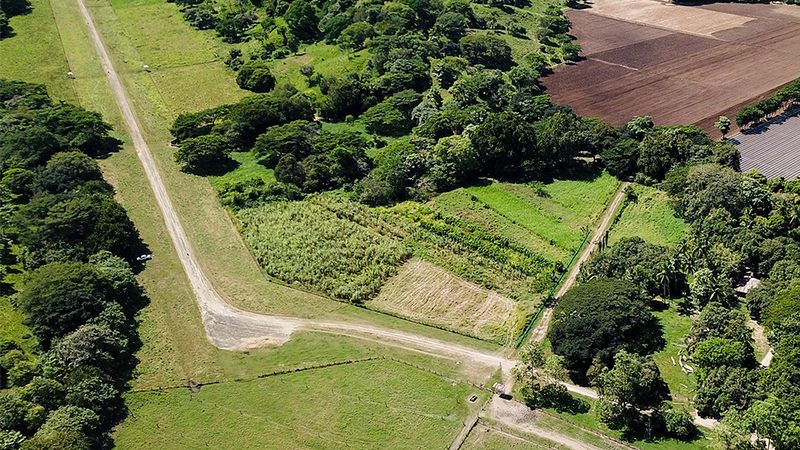 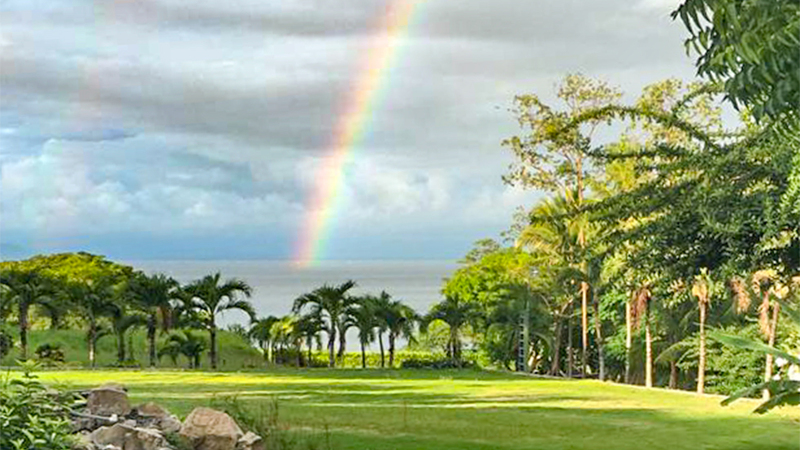 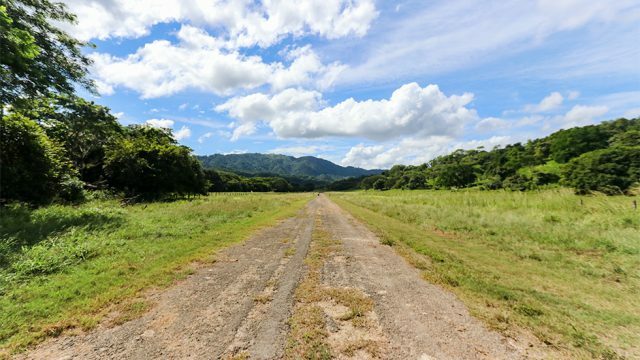 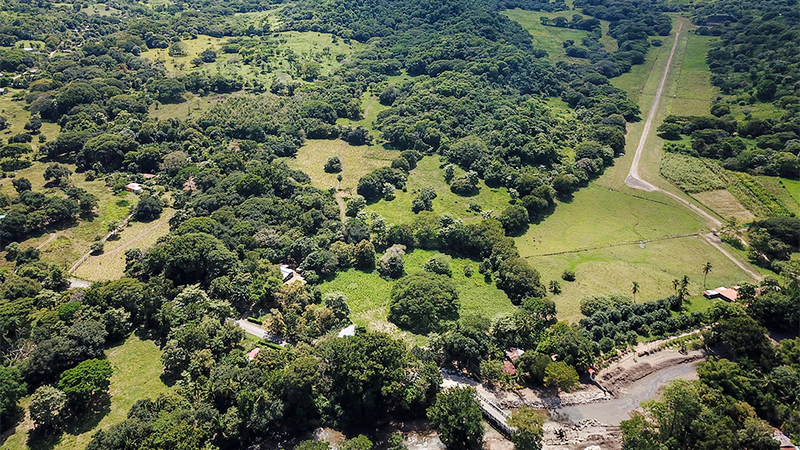 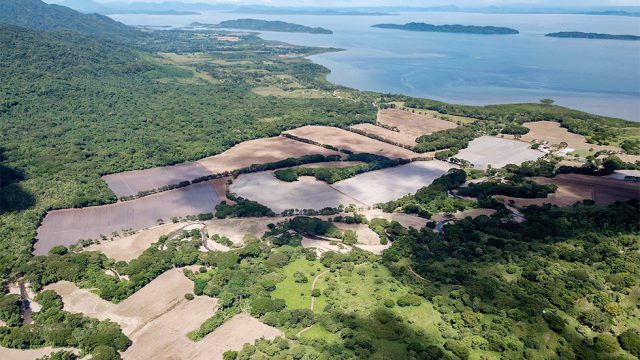 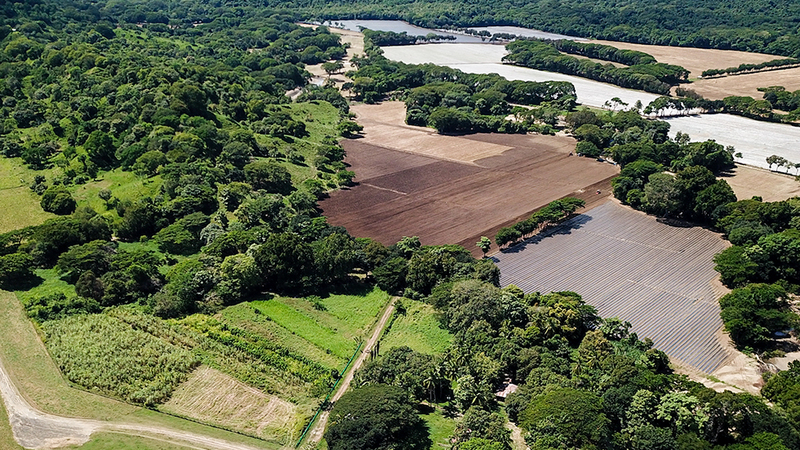 Private Airstrip – For a business catering to a luxury clientele, the property includes a private 1km long runway that is legally registered with the Costa Rican government. 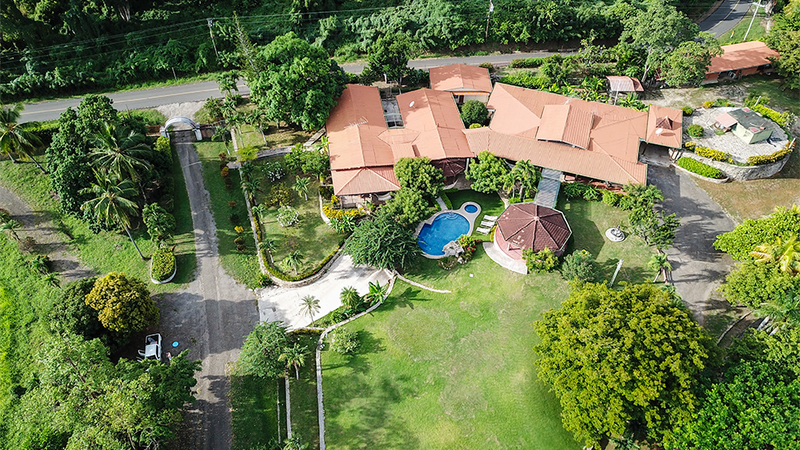 You and your guests can be whisked away from the International Airport and taken directly to the property with a flight time of approximately 20 minutes. 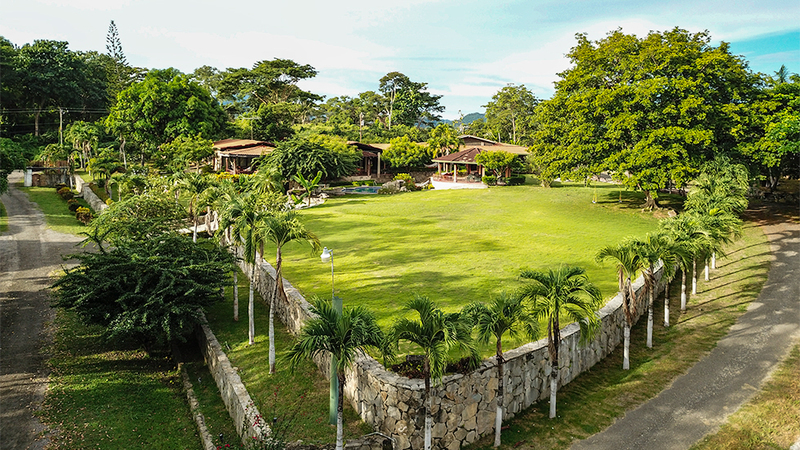 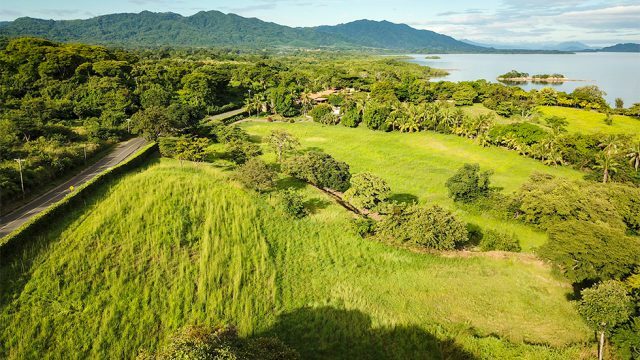 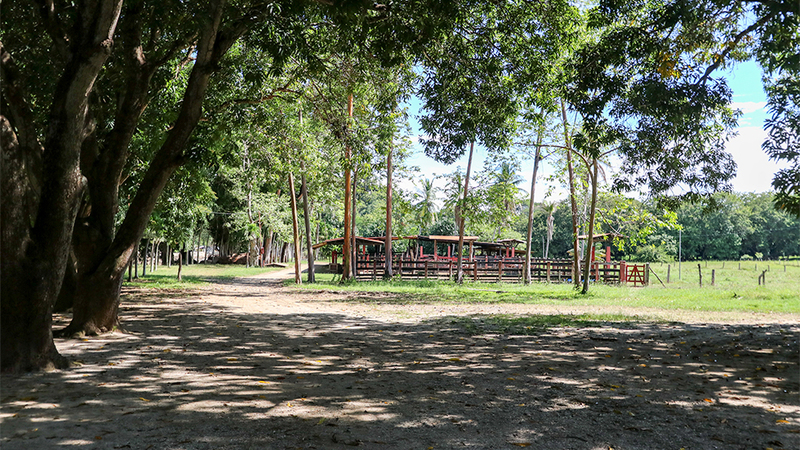 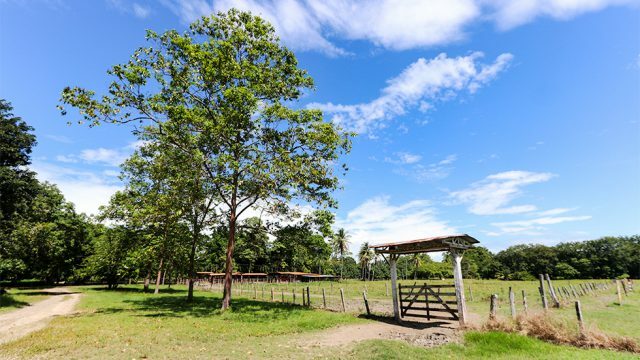 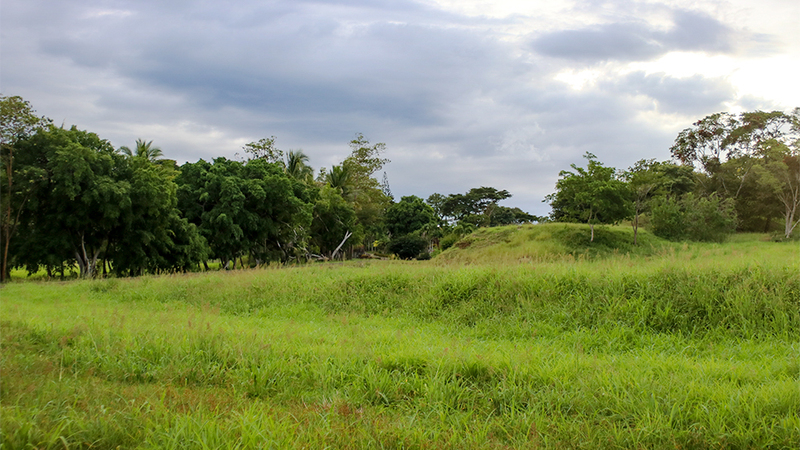 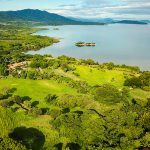 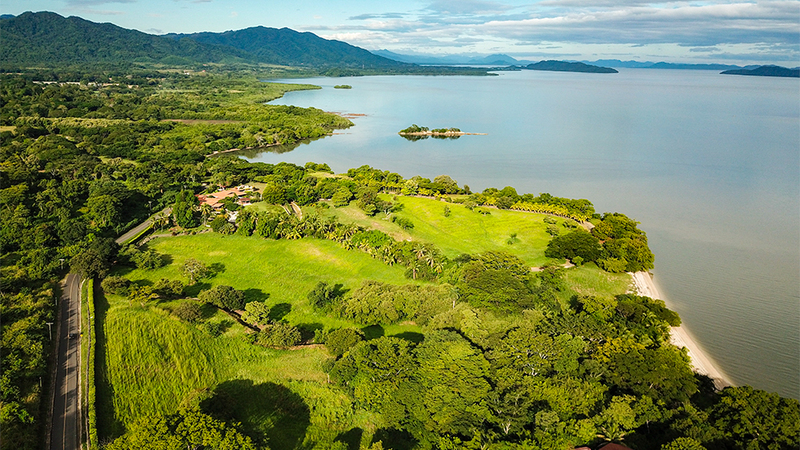 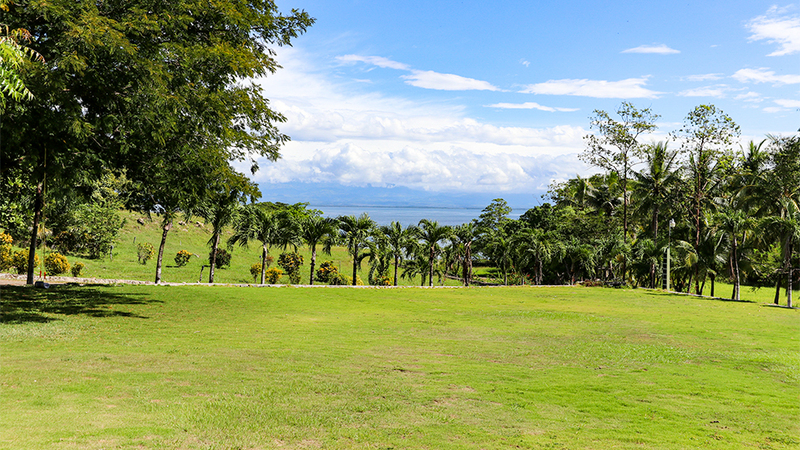 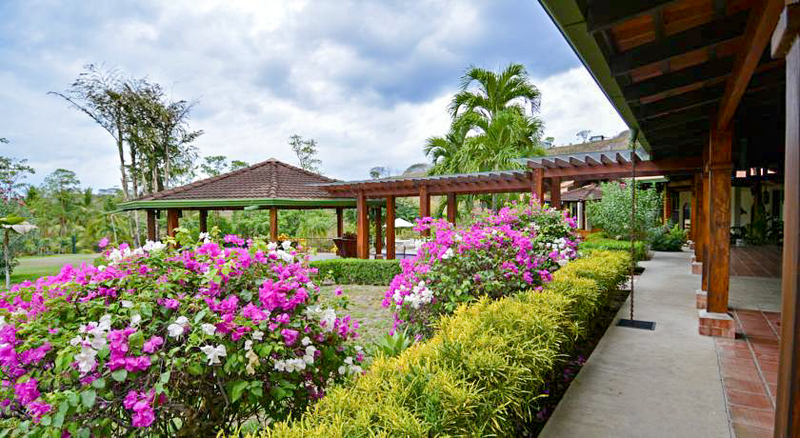 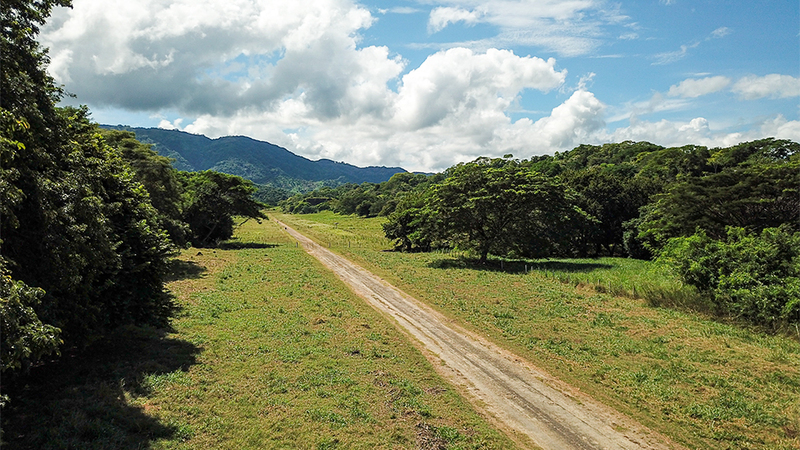 This airstrip can also be used for guest activities like Ultralight tours, much like the Auberge Resorts Collection provides from the Hacienda Alta Gracia in San Isidro, Costa Rica. 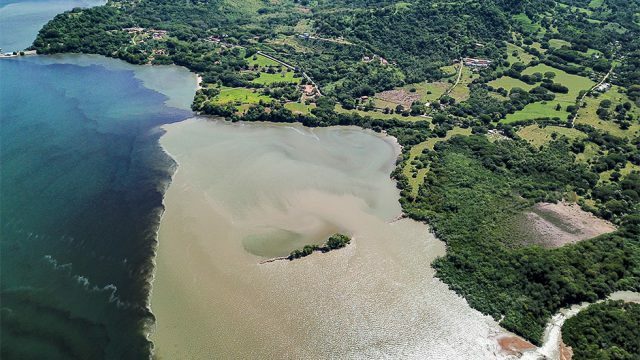 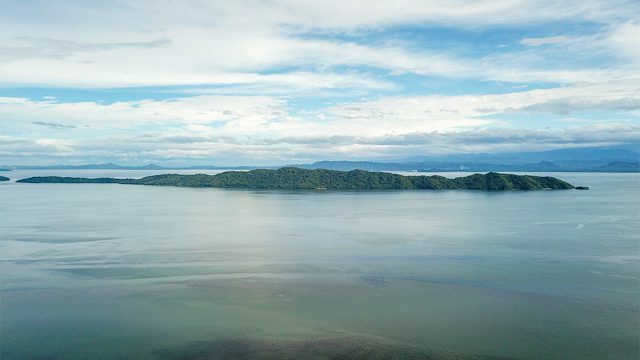 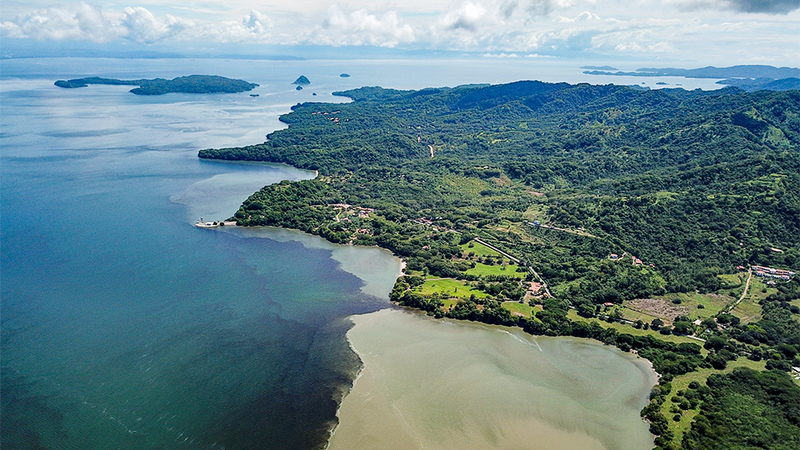 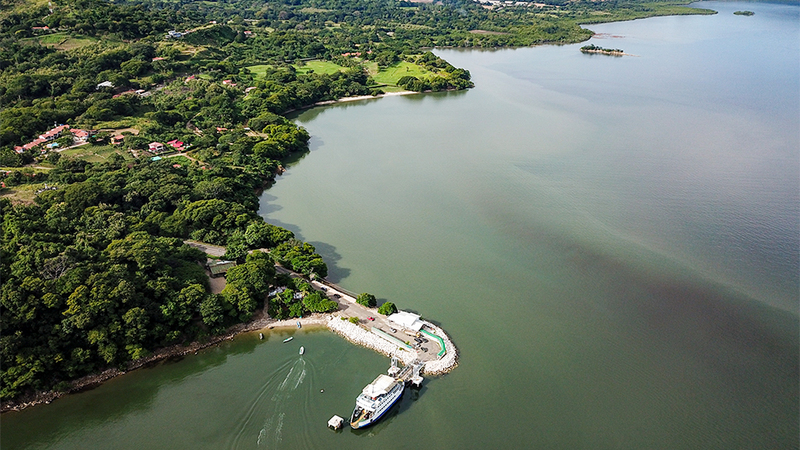 Zoned for a 65 Slip Marina – A marina could generate a significant revenue stream while allowing guests to travel by boat to and from some of the most popular tourist locations in the country, including the Marina Pez Vela in Quepos / Manuel Antonio and the Los Suenos Marina in the Jaco area. 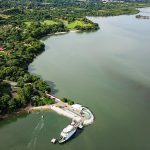 For buyers uninterested in building a full-service marina, a modular floating dock system could be an interesting option that can be put into service rather quickly. Currently, the property has a boat storage area and boats are easily launched into the Gulf via a trailer. 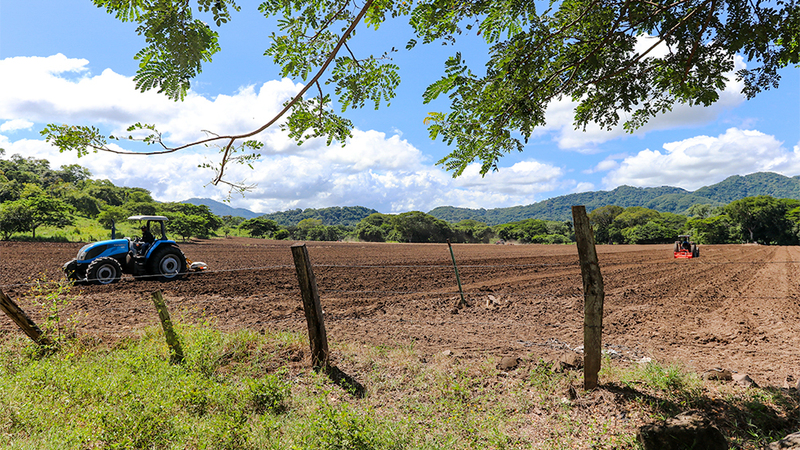 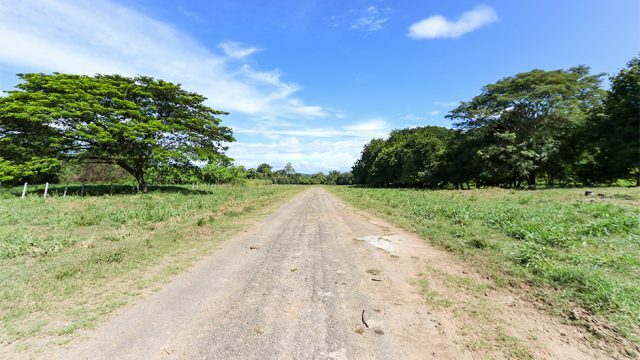 Public Road Frontage – Finally, guests can drive directly to the property on smooth, paved roads leading from other destinations in the Nicoya Peninsula and the popular Guanacaste region of Costa Rica, which includes the country’s 2nd International Airport located in Liberia (a little over 2 hours drive). 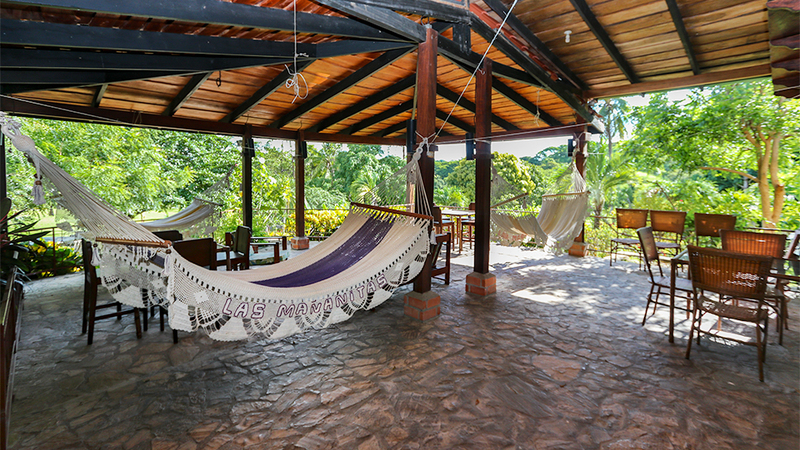 No matter how your guests get here, they will not want to leave after arrival. In front of National Paved Road leading to Jicaral, Nicoya, Liberia, Paquera, Tambor, etc. 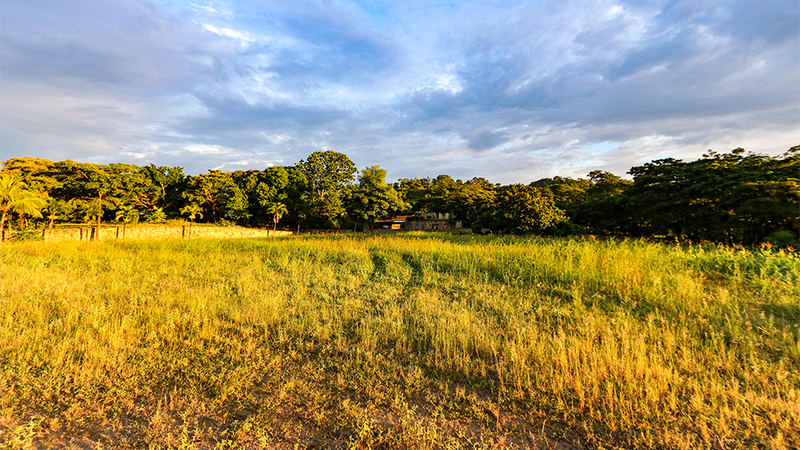 With over 1,000-acres of land to work with, it is easy to imagine the endless array of possibilities available here. 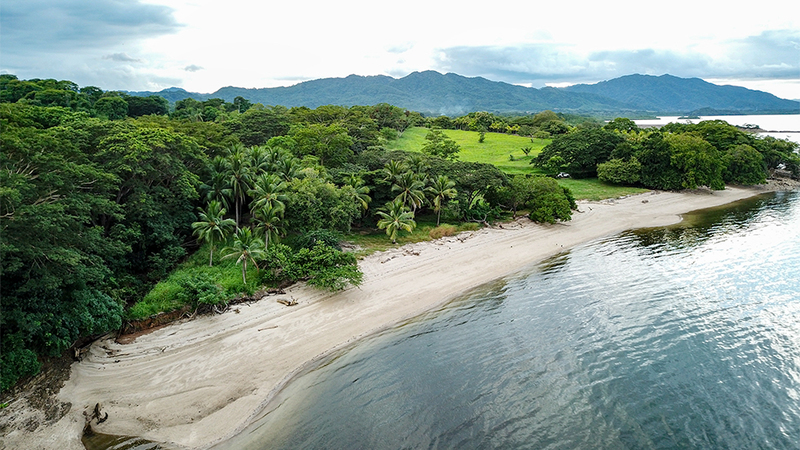 From an ultra-exclusive Health and Wellness Retreat featuring a private organic farm and riverfront yoga platforms, or a Residential Home Development offering ocean views and private boat slips, to a luxurious Oceanfront Resort and Spa, we feel this specific property is a home run!